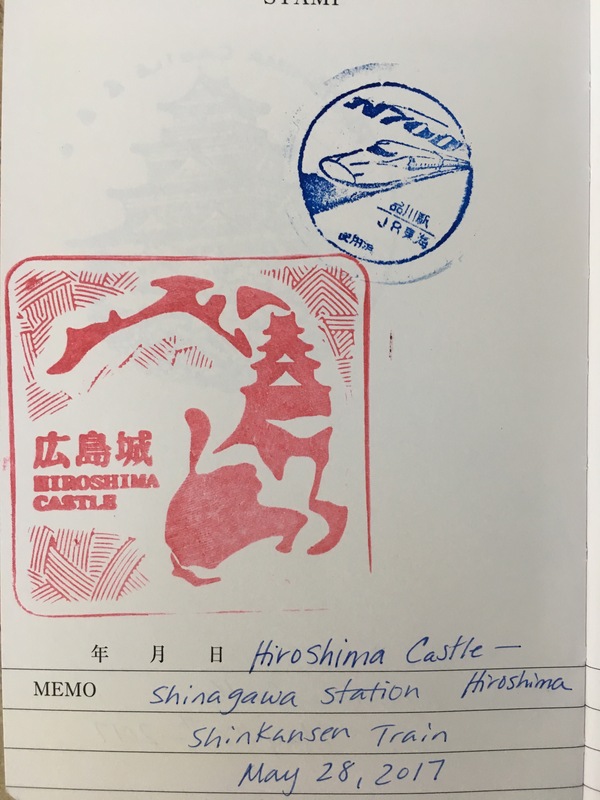 The tickets for our return trip on the Shinkansen didn’t depart Hiroshima until 1700. That gave us time to do a bit more exploring and shopping in Hiroshima. We gave the girls a chance to sleep in and have a little down time. Meanwhile, Danny, Jenn, and I went for a morning walk. There was a long green way trail stretching along the river. The best part was the Sakura lining the path. 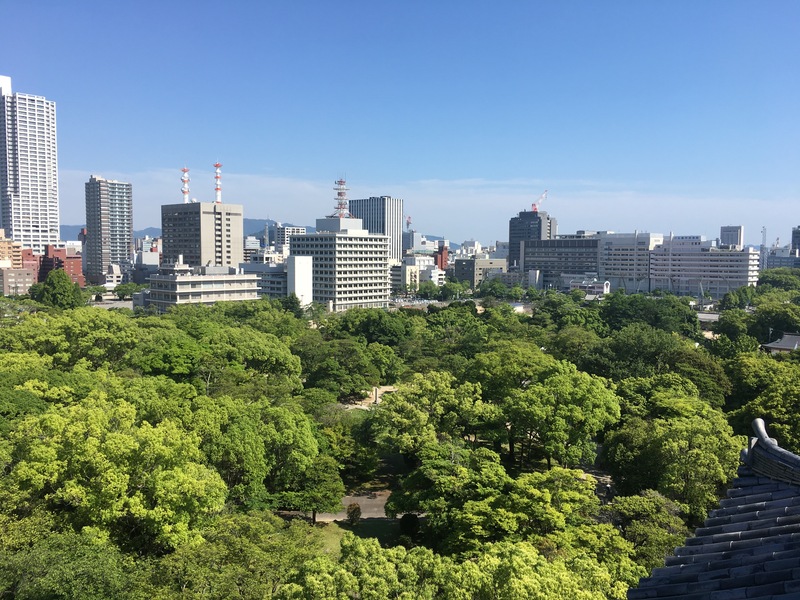 After breakfast, we headed out to explore more of Hiroshima. 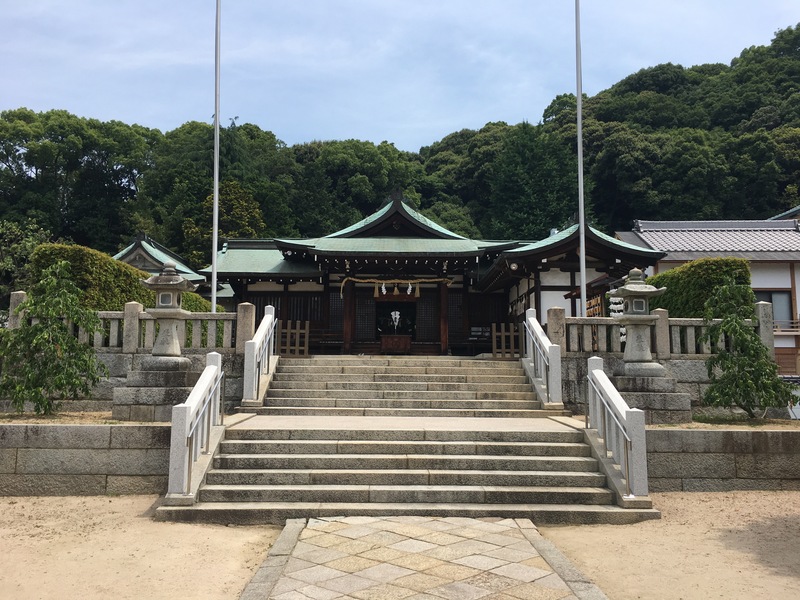 The next area on our visit list was a stop at the Gokoku Shrine. 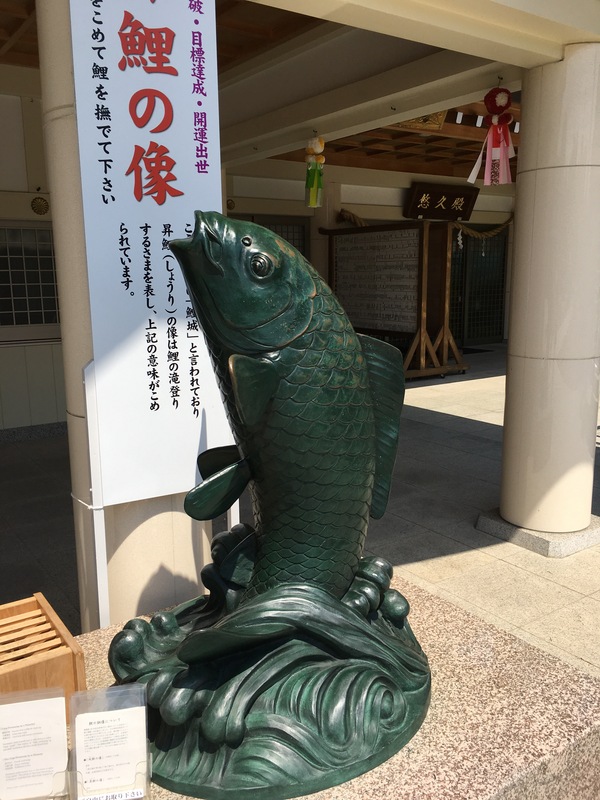 The double fish statue at the Shrine represents family happiness. Happy family indeed! Especially, when our next stop is for ice cream! Ice cream makes everything better and everyone happy. Finally, after all that we got down to business. 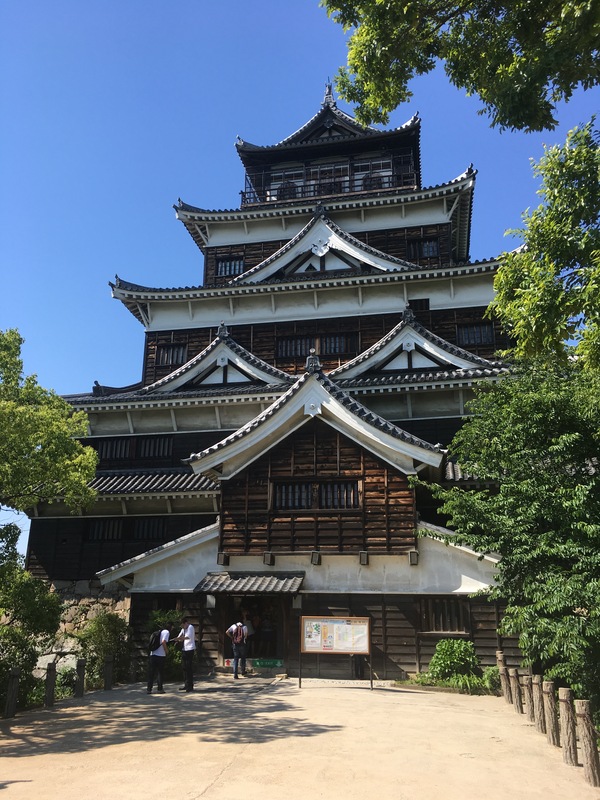 We made our way to the Hiroshima Castle. I’ll just cut to the “Chase” and summarize our visit to the castle. The highlight was obviously dressing up these two as a Samurai and a Lord. I’m still giggling when I look at those pictures. We managed to climb to the fifth floor of the castle and enjoy a spectacular view. By the time we finished exploring the castle, we were ready for an American lunch. A beer, cheeseburger, and fries filled the need. The crane and driftwood were an added bonus. The remainder of the afternoon we shopped and prepped for our Shinkansen trip home. We had plenty of food to keep us happy. Cheers! We had such an amazing trip to Hiroshima. We made it home safely and with so many memories. 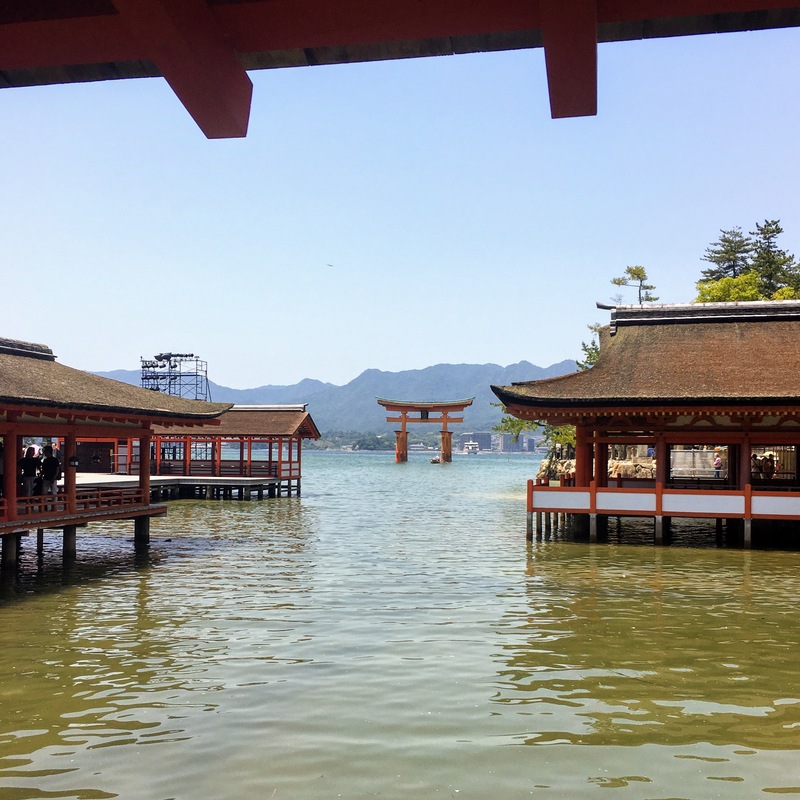 Our second day in Hiroshima was spent on Miyajima Island. 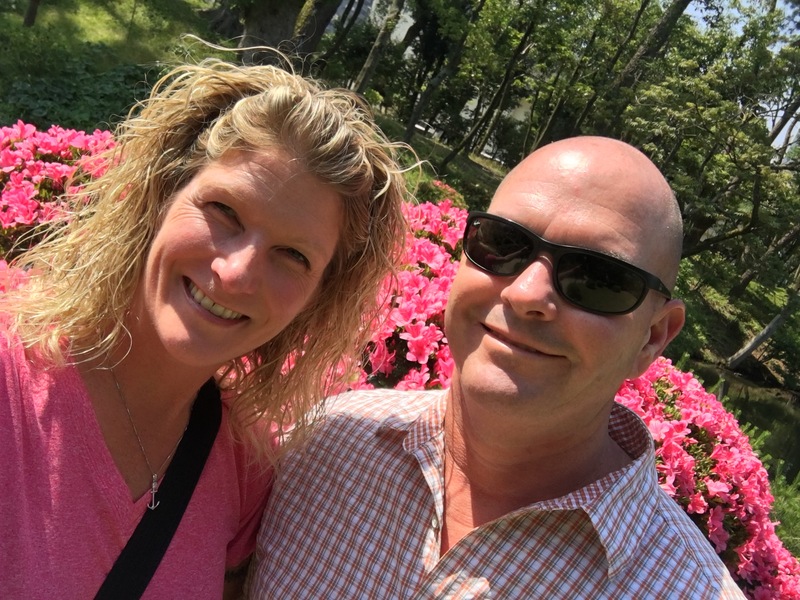 When Dave and I visited last May, we didn’t have much time to explore the island. 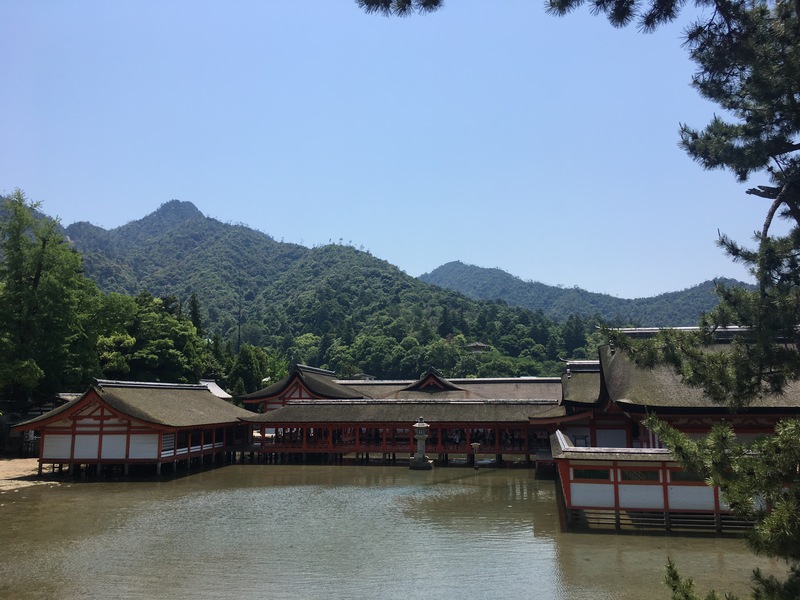 We only had time to visit the Itsukushima Shrine and enjoy lunch. 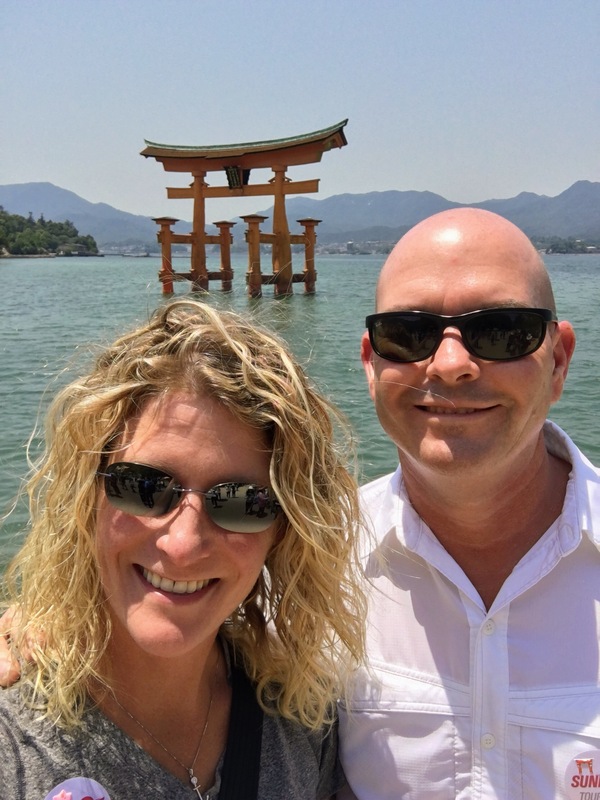 As I planned the Thompson’s visit, I wanted to include time to explore the entire island and see the giant Torii at both high and low tide. We took a couple trains to Miyajimaguchi Station to catch the ferry to the island. Inevitably, with every Julia tour, sooner or later we will hop on the wrong train. It happened yesterday. We got on the street car instead of the subway. Fortunately, I noticed after the first stop and we exited at the second. While on the crowded streetcar, Chase snapped a selfie. I guess being on the wrong train wasn’t a complete waste. The rest of the trip to the island was smooth sailing. We found the right trains and boarded the ferry. We arrived on the island at high tide. 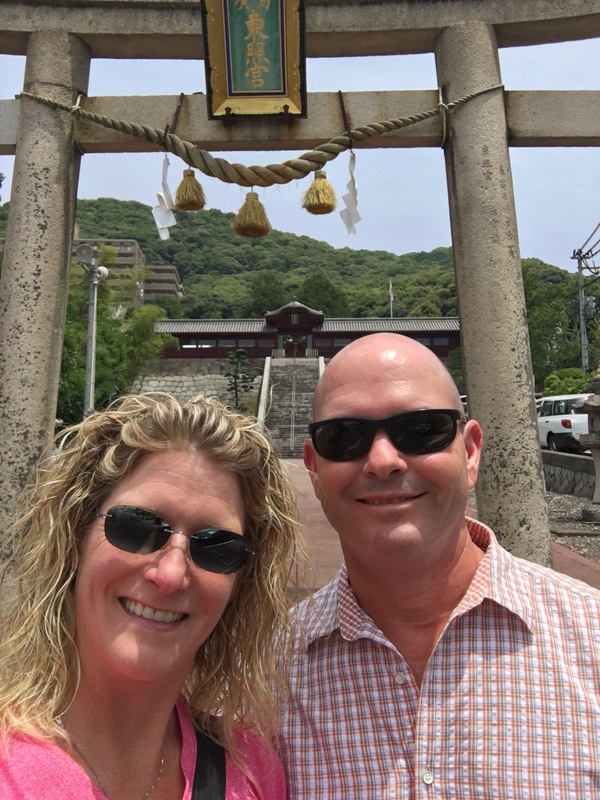 As we walked to the Itsukushima Shrine, we stopped for a few tourist photos. 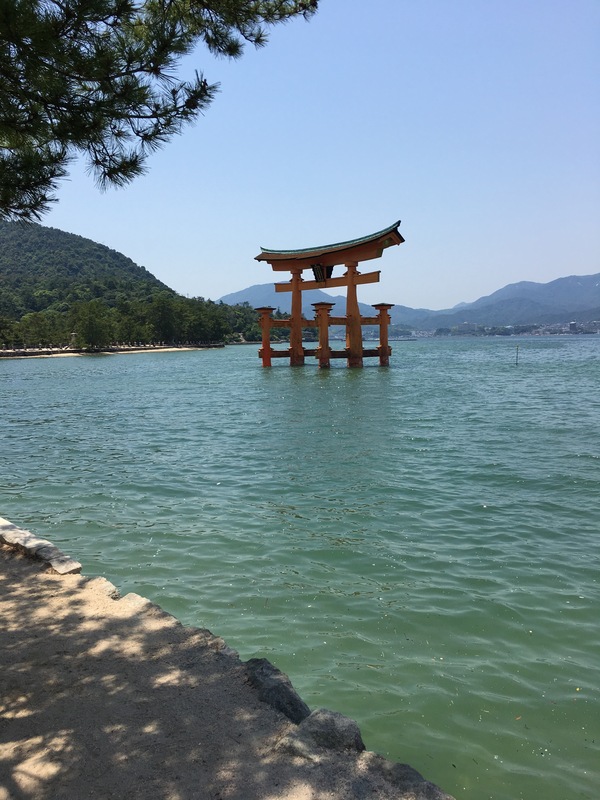 The Torii at high tide is beautiful. 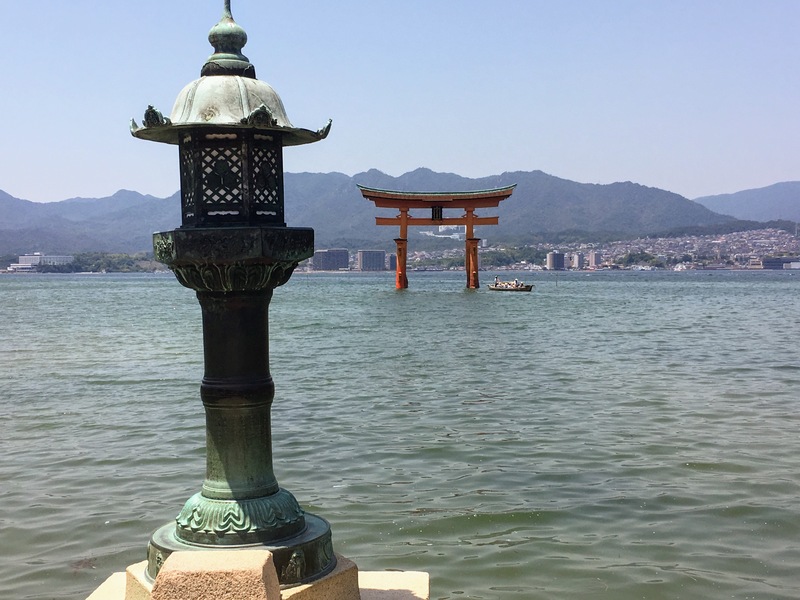 The Shrine and Torii both appear to be floating. 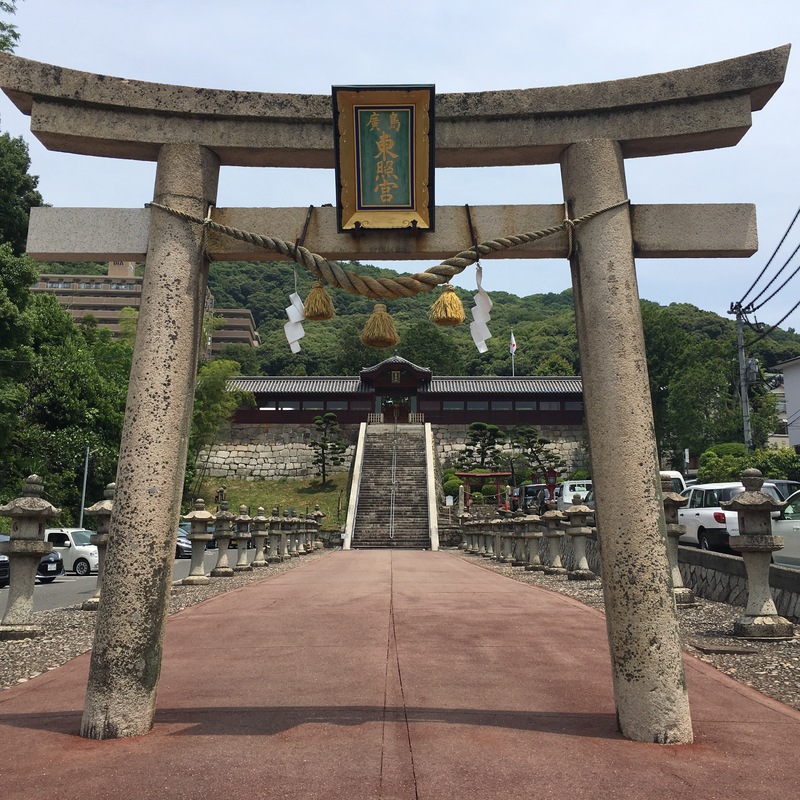 After our visit to the Shrine, we began our walk up to Mt. Misen. The walk was enjoyable and we felt lucky to see even more Sakura. Along the way, we stopped at a nice restaurant for lunch. 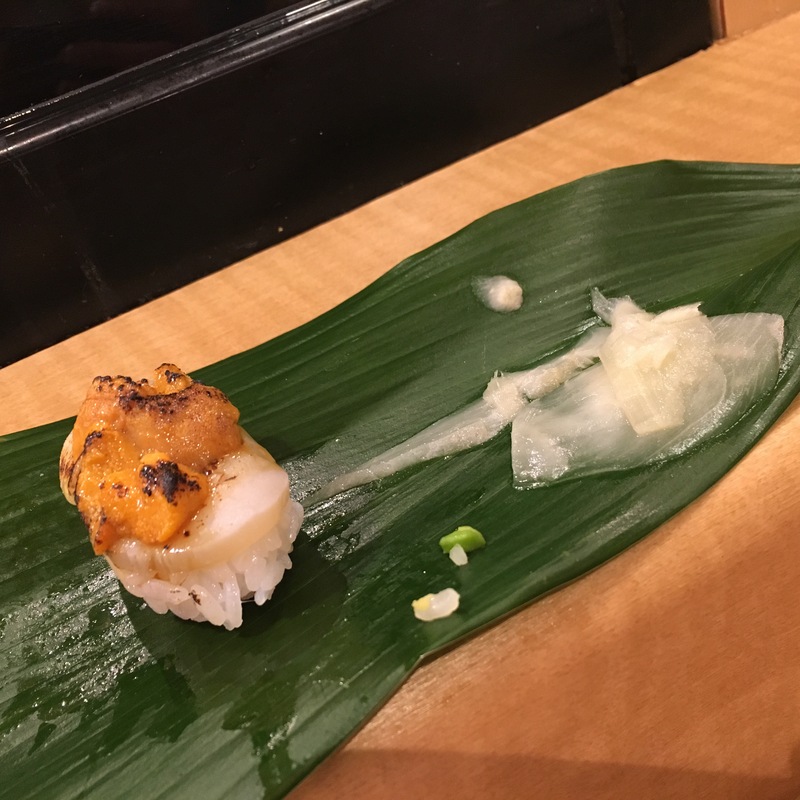 It was delicious Japanese cuisine. We continued our walk and came to an area with a few Sakura trees. As the wind blew, the Sakura petals scattered. It was definitely a highlight. Our favorite part of this little park was the opportunity for refreshments. Including Bears. Yes, please. I would love a Bear! Up and up we went. No Julia Tour is complete without a hill to climb. 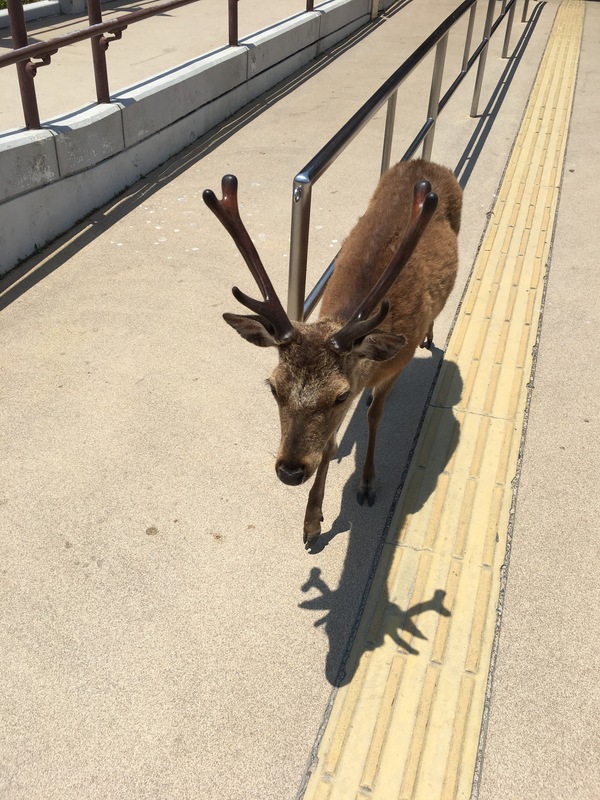 We made it to the Ropeway and took two trams to the overlook. The view from the lookout was amazing!! From the lookout point, we started our way down the mountain. It would take about an hour and we wanted to be down in time for low tide around the Torii. We thought walking down would be easy… But, everyone’s legs were shaking by the end. 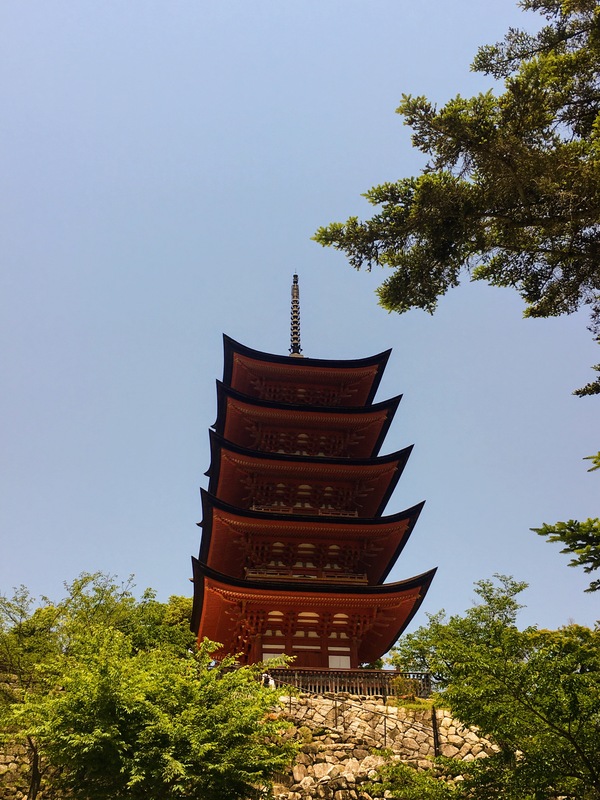 We made a quick stop at the five-story pagoda as we walked past. 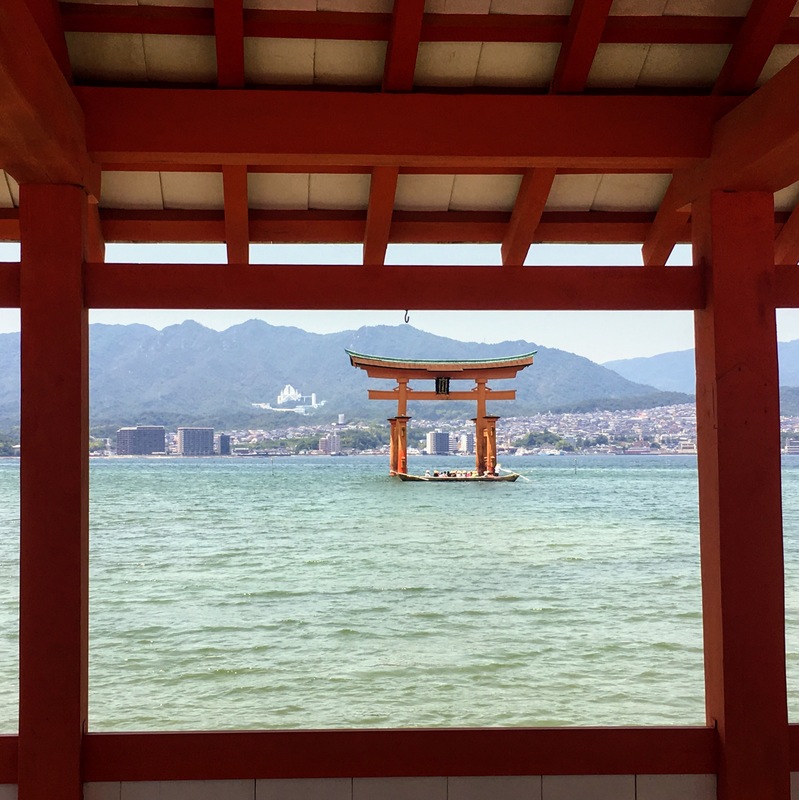 Our timing was perfect for catching the Torii at low tide. It was even more beautiful than I expected. We made one last stop for ice cream before leaving the island. We crossed back on the ferry and took a train back to our hotel. We were all pretty tired from a fun day exploring and hiking. Monday morning we caught the Keikyu line train to Shinagawa. I know I already mentioned the Keikyu Line and Rilakkuma campaign. I must mention it again because we have enjoyed spotting cute trains and bears. Check out the giant Rilakkuma in Shinagawa Station. So, cute. From Shinagawa we caught the 10:07 Shinkansen to Hiroshima. Again, I was so excited. I took a video as we waited for our train. The train ride was about four hours. We bought lunch for the trip – bento boxes and Japanese sandwiches. Plus, kawaii company with the adorable Rilakkuma characters dressed as Keikyu Train Conductors. Our train arrived four hours later. 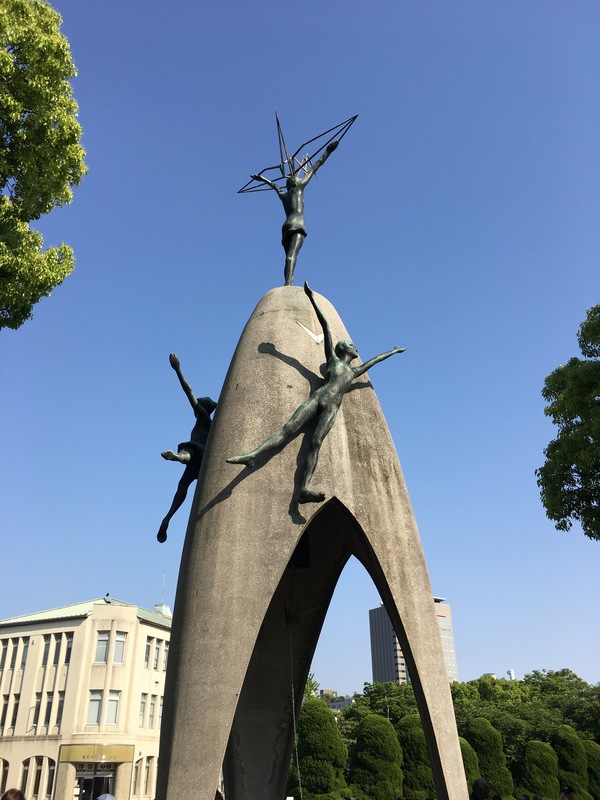 We caught a taxi to our hotel, dropped our bags and headed to the Hiroshima Peace Park. 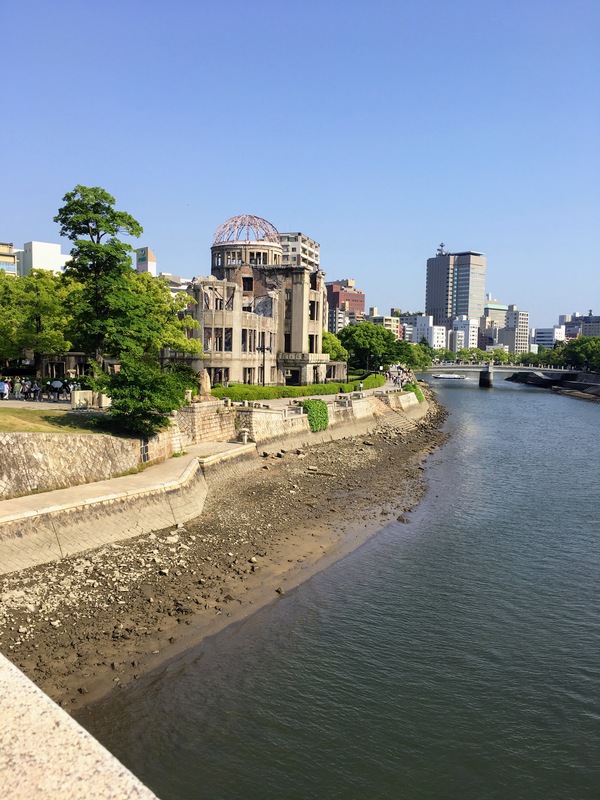 Our first stop was to see the Atomic Bomb Dome. We were pleasantly surprised to still see Sakura in bloom. The girls stopped and rang the Peace Bell. As all the tourist ring the bell, the sound brings a calling for peace. It’s beautiful. Our next stop was at the Cenotaph. The Eternal Flame ignited us with hope for peace. After visiting the museum, we walked to the fountain. Danny snapped this picture of the girls. To me it symbolizes the power of peace. He has also taken many other pictures I’ve used in sharing their story. I appreciate having an extra shutterbug and an iPhone 8 Plus. 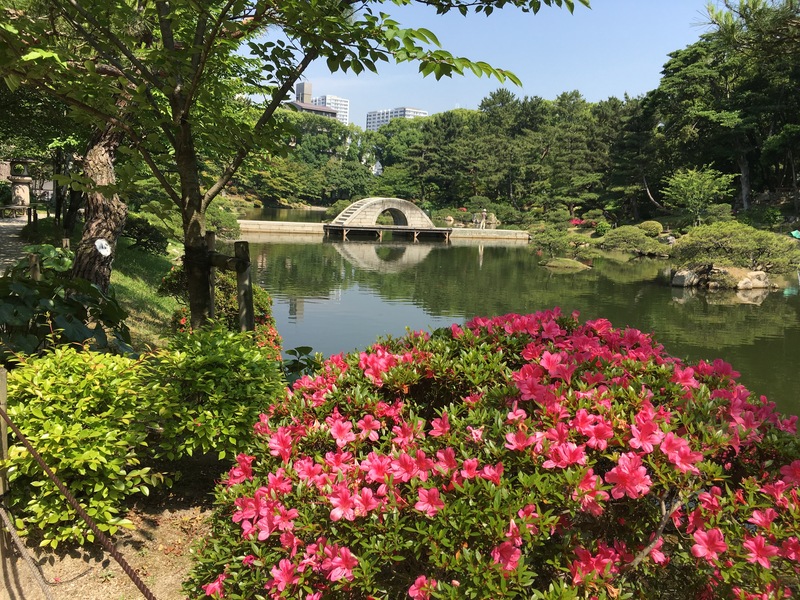 We made our way out of the park and enjoyed more Sakura and tulips. 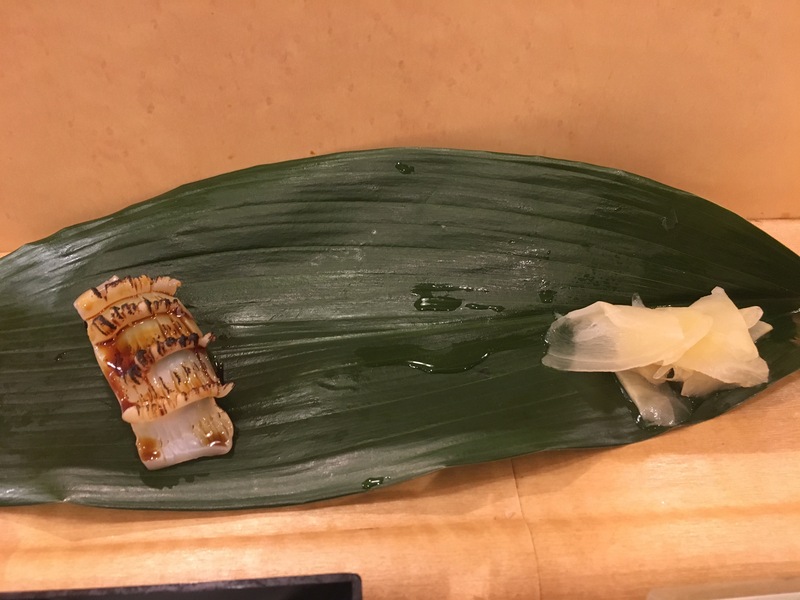 About six weeks ago, my friend Sonia told me about the Eki stamp. Eki means train in Japanese. 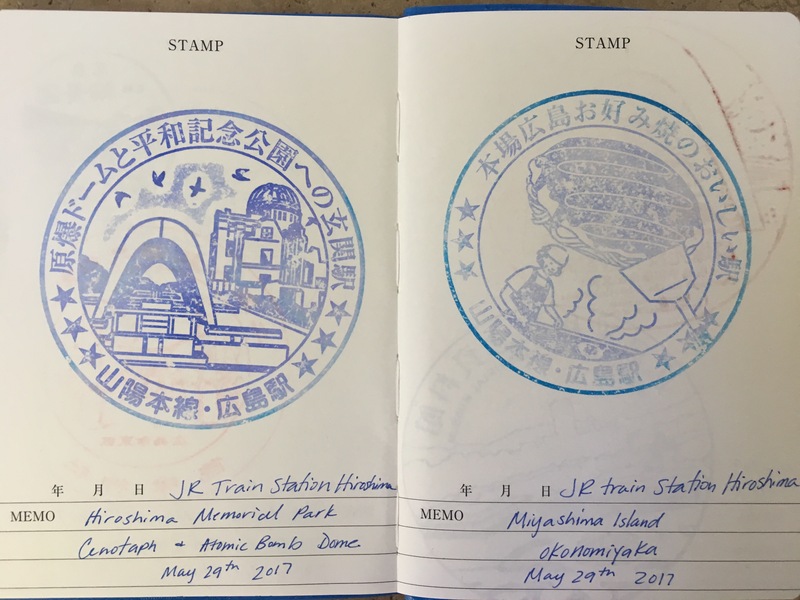 An article she shared with me, discussed how each of the 9,161 trains stations in Japan each have their own unique stamp. 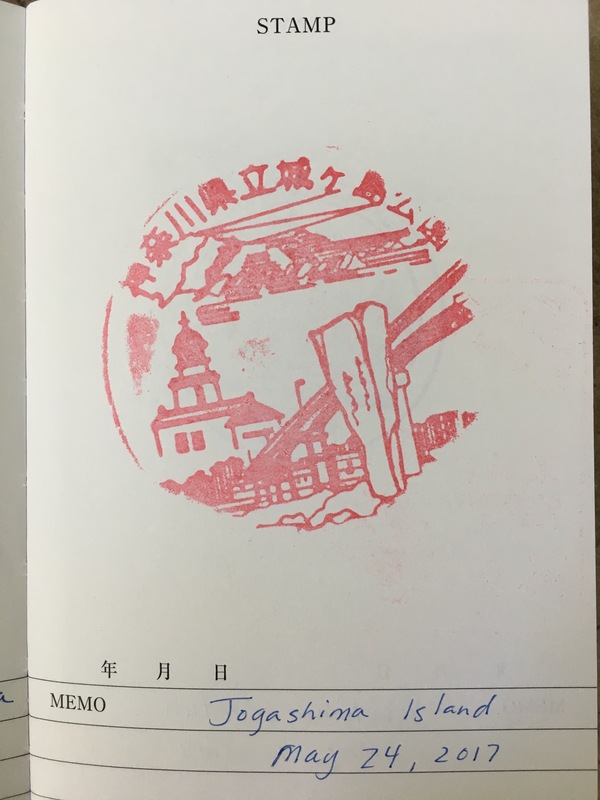 The station stamps usually feature a picture of a local attraction. 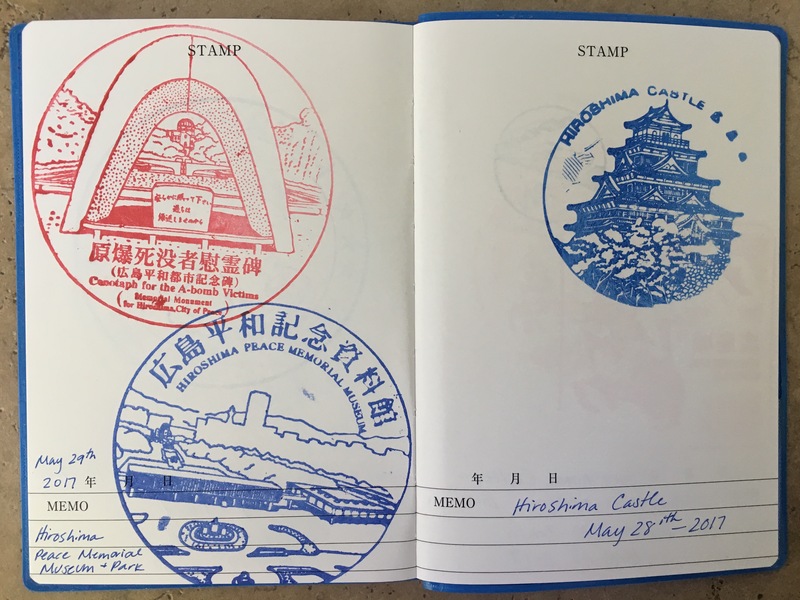 The stamps are free and fun way to document your travels around Japan. 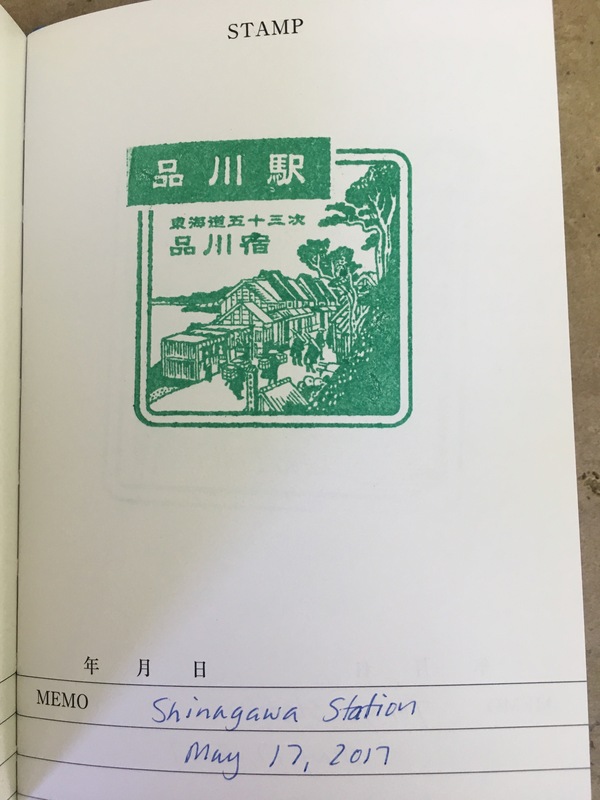 The article also pictured a Eki stamp book. Dina and I searched for about a month to find them and when we did, we bought one for us and Sonia. 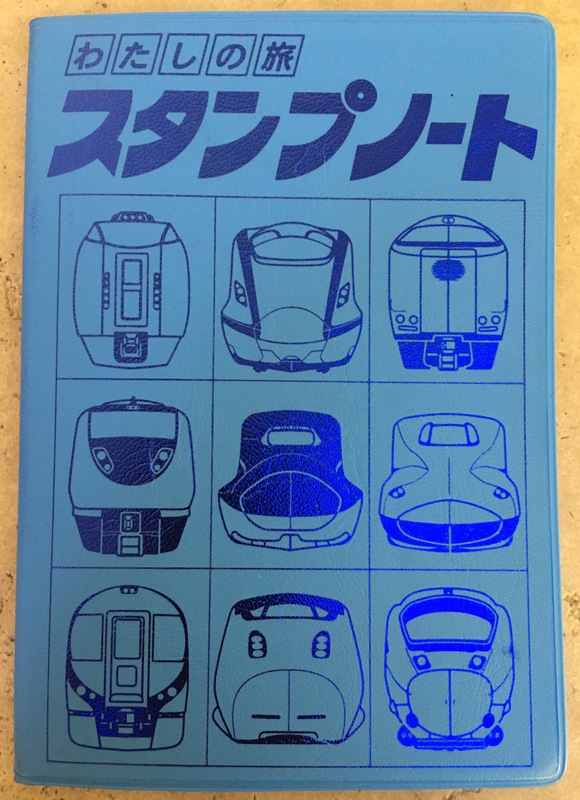 A cute and inexpensive (¥600) book to fill with stamps! Since finding the books, we have been diligently working on collecting stamps. 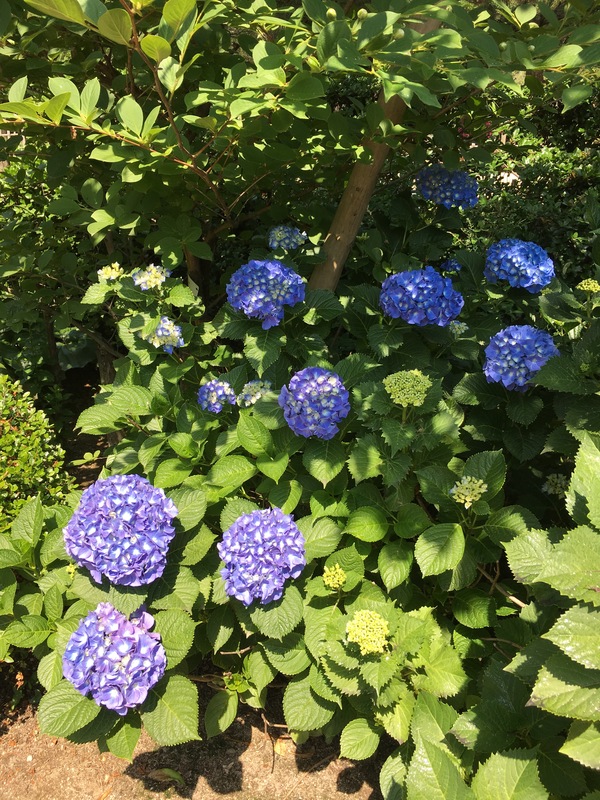 We collected several on May 17th when we went to visit the Kyu-Furukawa Gardens in Tokyo. 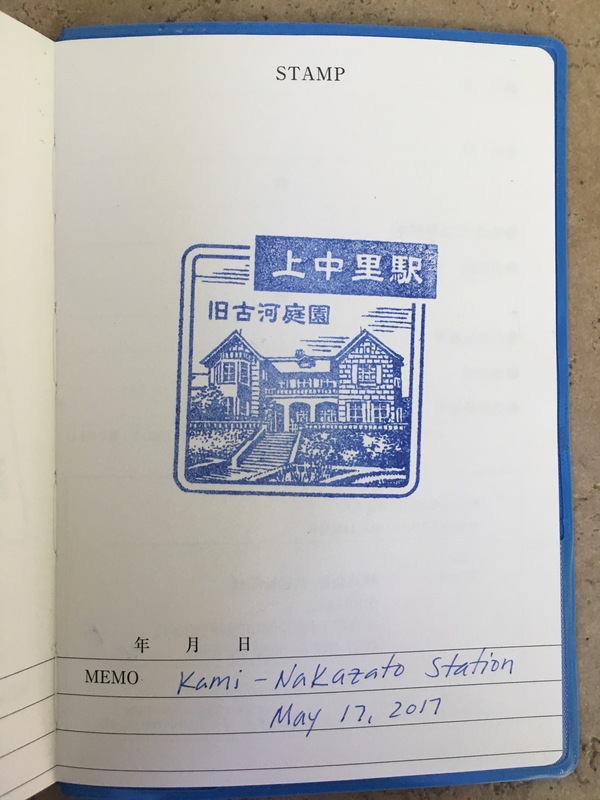 The first stamp we found was at the Kami-Nakazato Station in Tokyo. 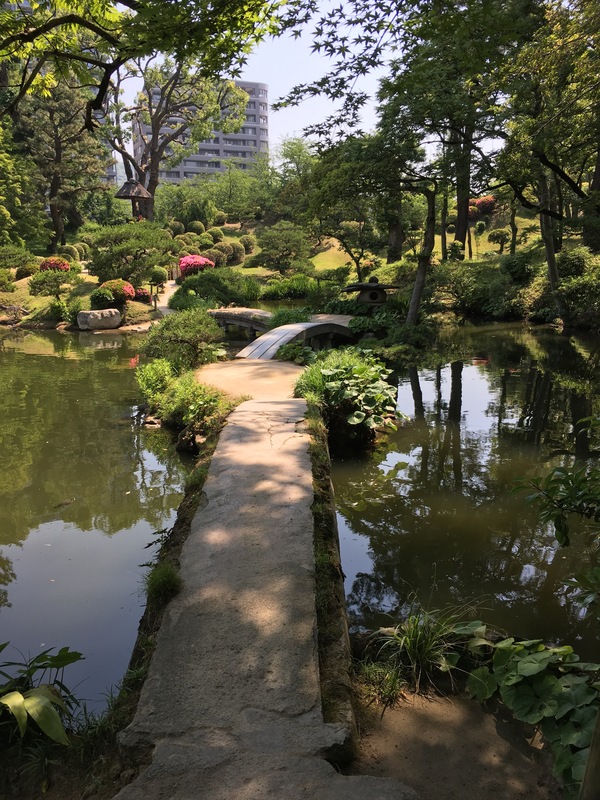 It pictures the house at the Kyu-Furukawa Gardens. 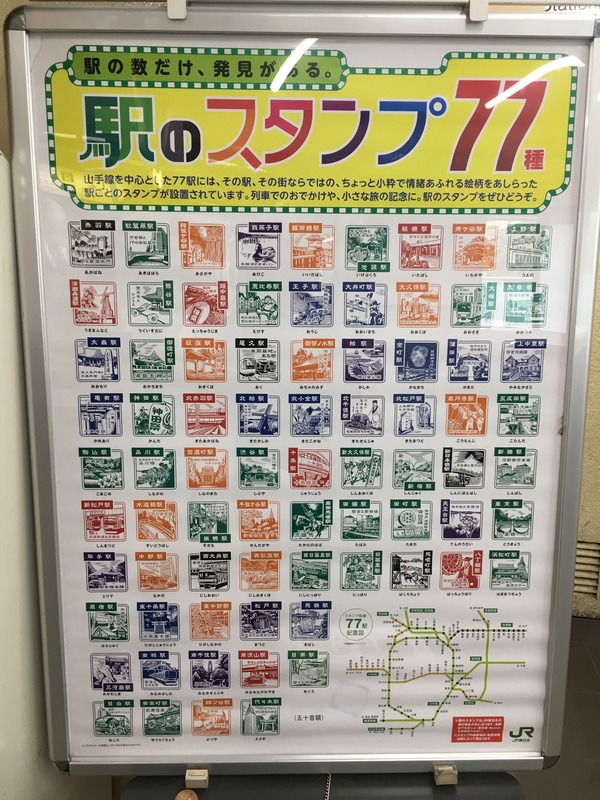 The JR trains have a series of 77 stamps to collect. I took a picture of the sign of the different stamps to help us on our Eki stamping scavenger hunt! 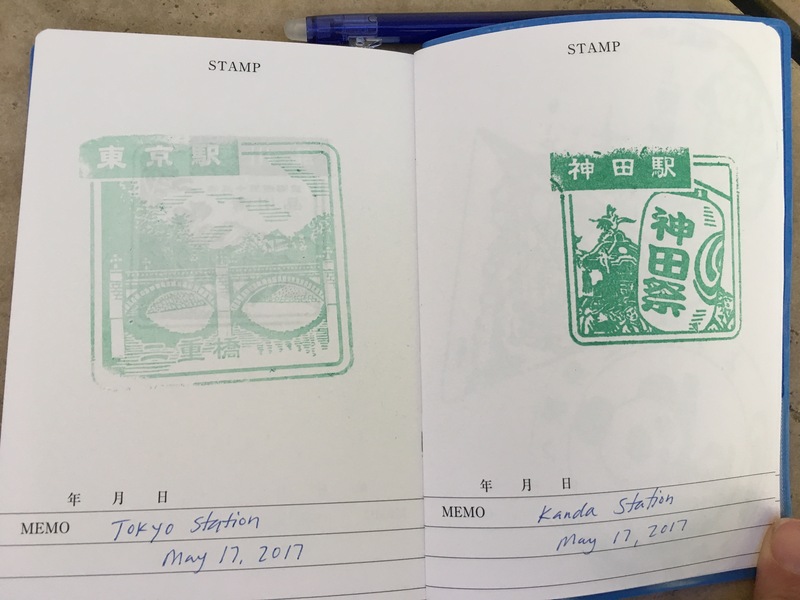 As we traveled home, we stopped at several extra stations just to hunt for stamps. And I must stress – hunt. The stamps are not always easy to find. We have learned they are typically located near the “Central Exit” of the station. This is key because many of the larger stations have multiple exits. 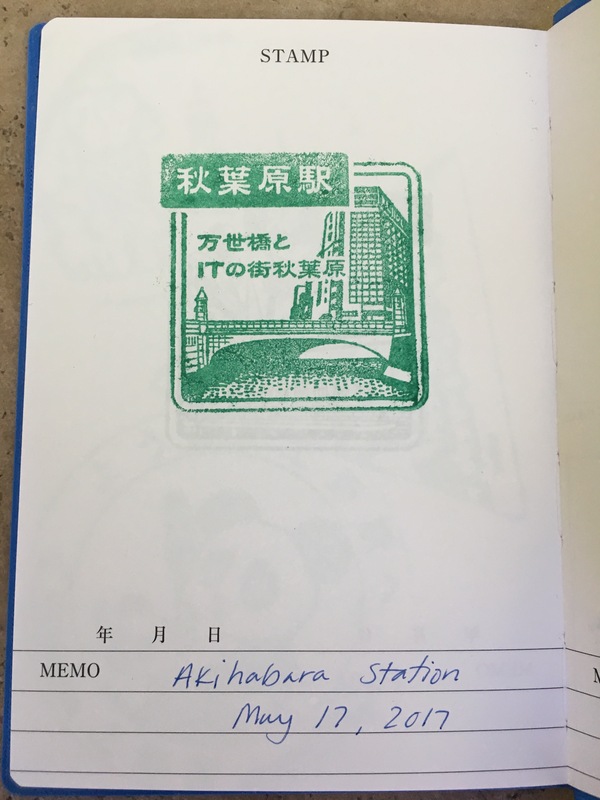 Ueno Station alone had four stamps! And no, they were not all in the same location. 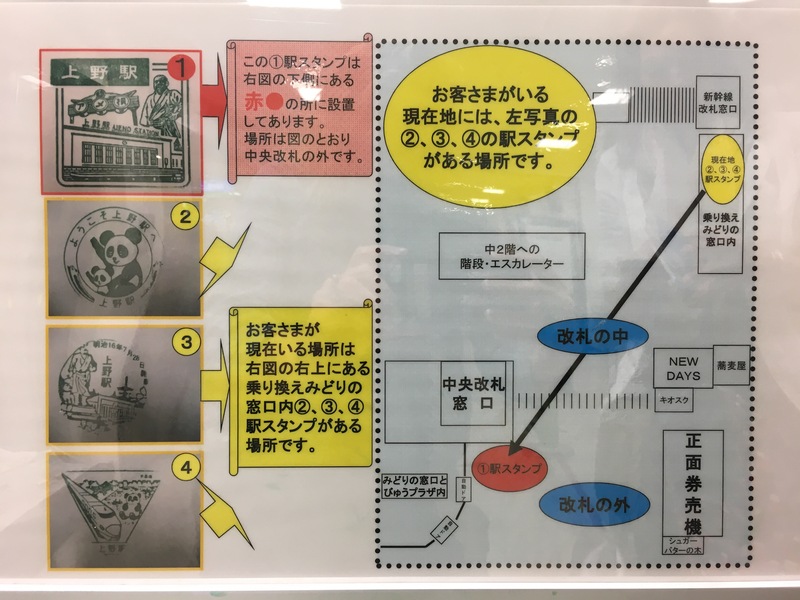 Here is a picture of the map in the station to help you find the other stamps. We stopped in Tokyo, Kanda, and Shinagawa station. Each of these stamps were relatively easy to find now that we knew to look for the sign around the Central Exit. 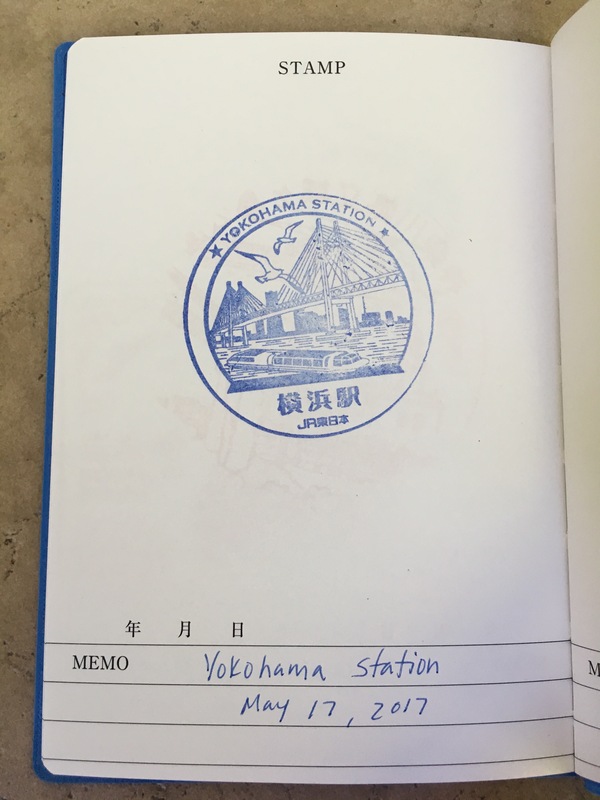 Perhaps the most tricky was Yokohama Station. We walked around for several minutes before asking at the ticket center. We were directed to the train office. It was down a side hallway and around the corner. But, we found it! The extra fun part about the stamps is that they are not just limited to trains stations. 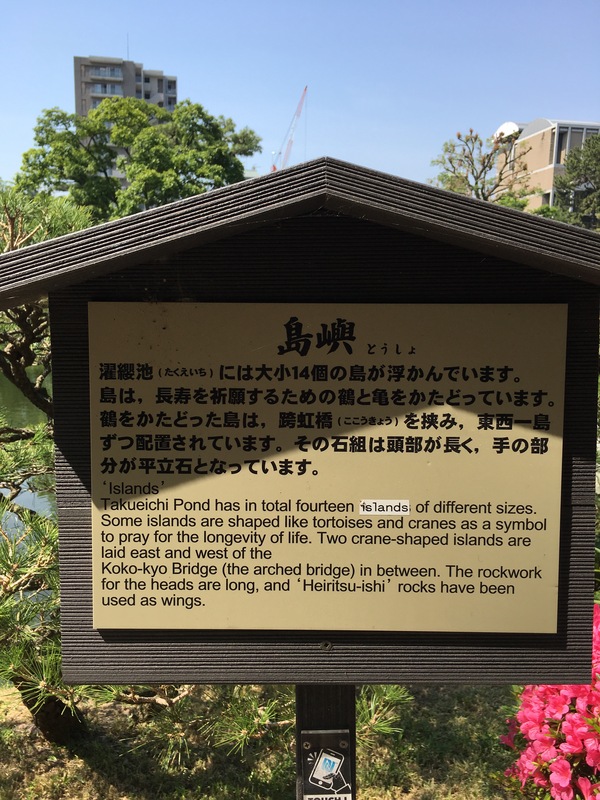 They are also available at many parks – Jogashima Island Park. 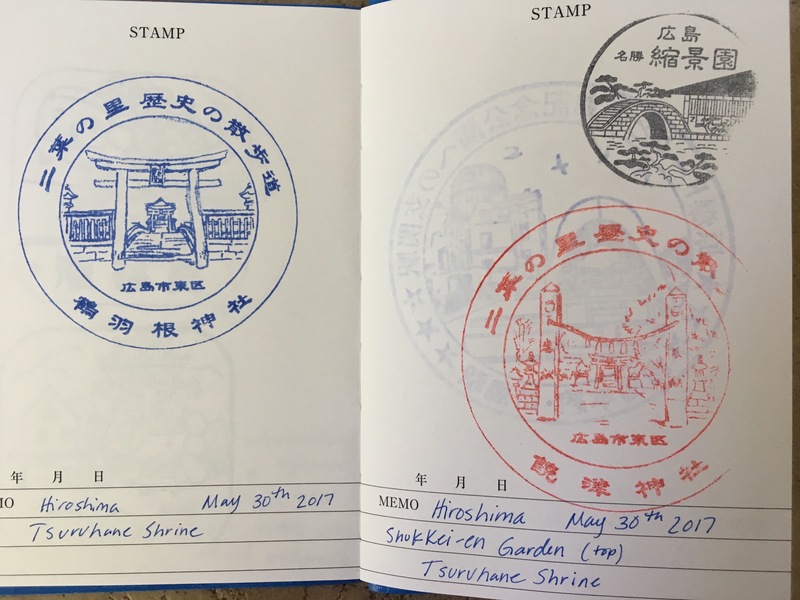 Dave and I were able to collect several during our trip last weekend to Hiroshima. 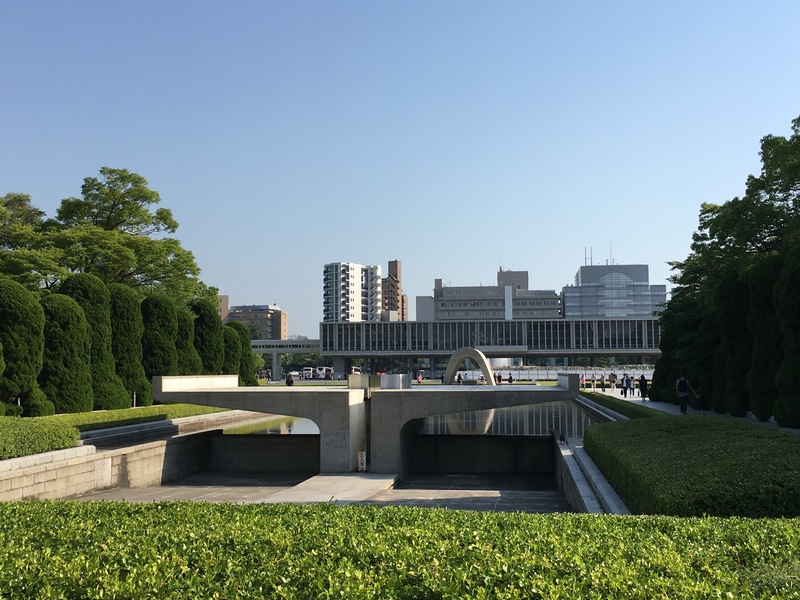 The Shinkansen, Hiroshima Castle, and Hiroshima Peace Memorial Park. We found them of course at the JR Station in Hiroshima. 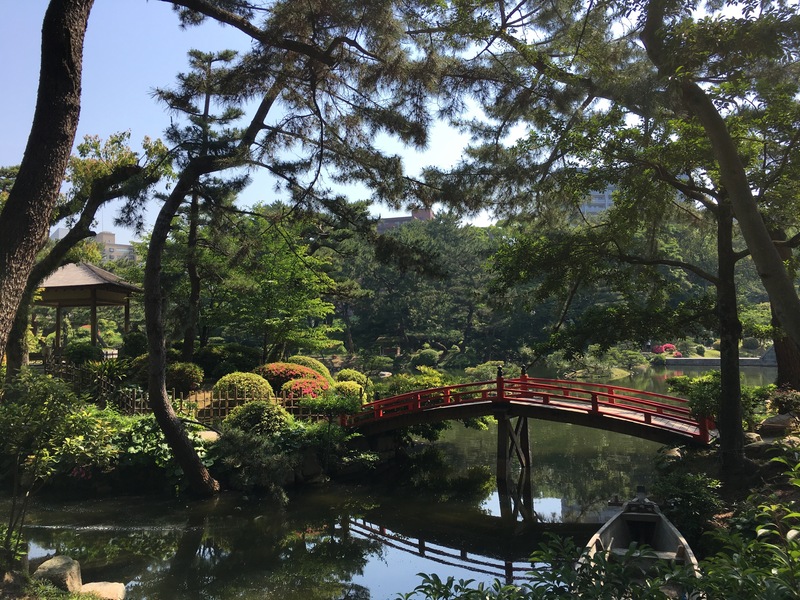 And even at the Shukkei-en Garden, Tsuruhane Shrine, and Toshugu Shrine in Hiroshima. 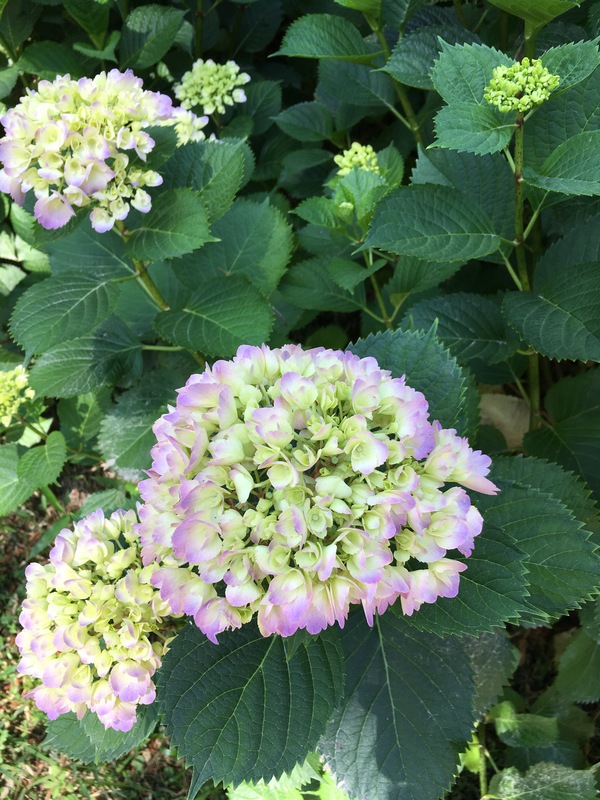 This past week, Dina and I went over to Hase Station in Kamakura and discovered another series for the Endoshima Line. I am planning on buying several the next time I find them at a store. I want you to have one when you visit. 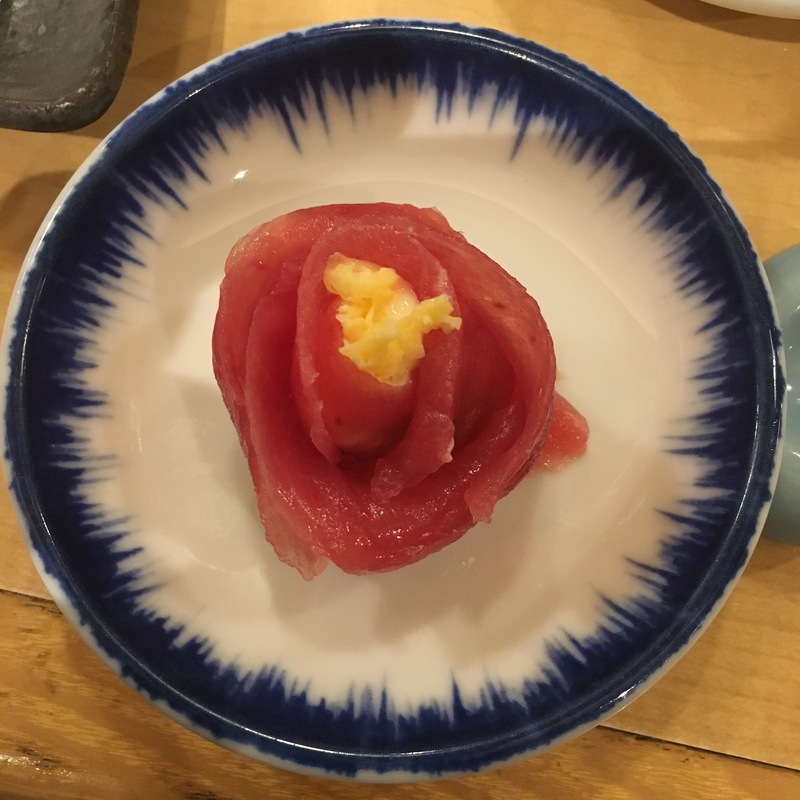 I think it will be a fun way for you to document where you/we went around Japan. Especially, if you are coming with a kid or two in tow. 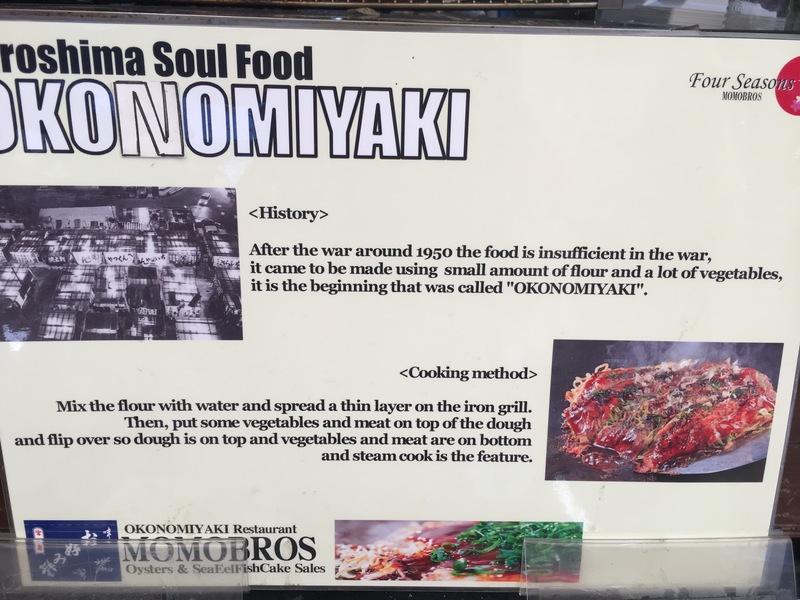 The city of Hiroshima has several other notable attractions. 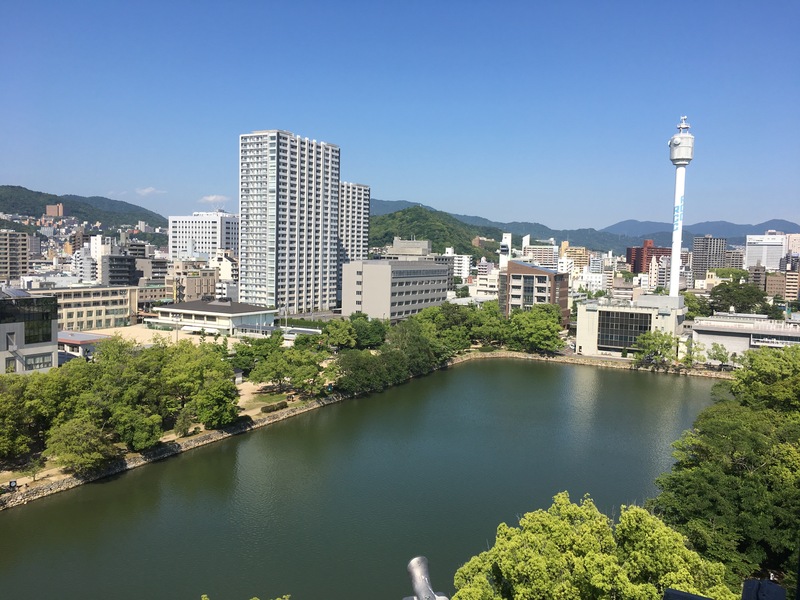 One is the Hiroshima Castle. 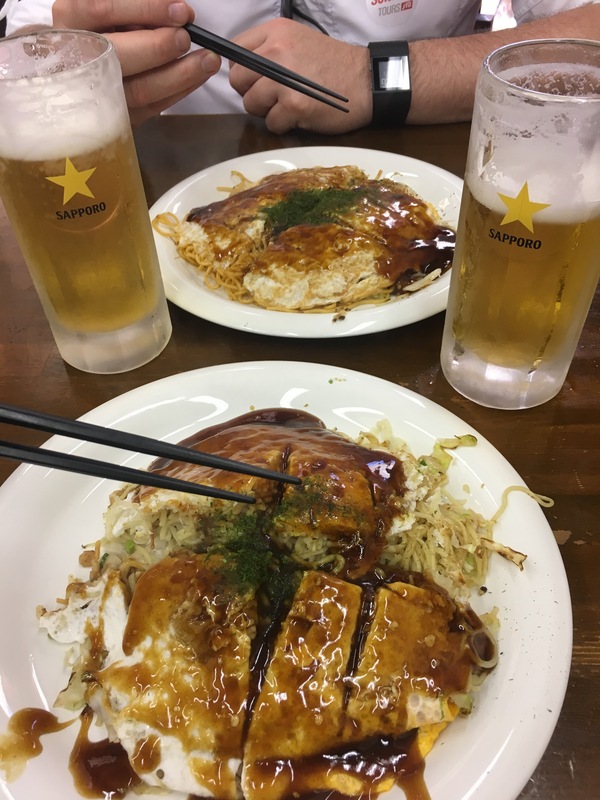 It was a short walk from our hotel and the perfect way to stretch our legs after our ride on the Shinkansen. The original castle was destroyed in the bombing and reconstructed. The views of the city from the top level of the castle were lovely and so was the breeze! 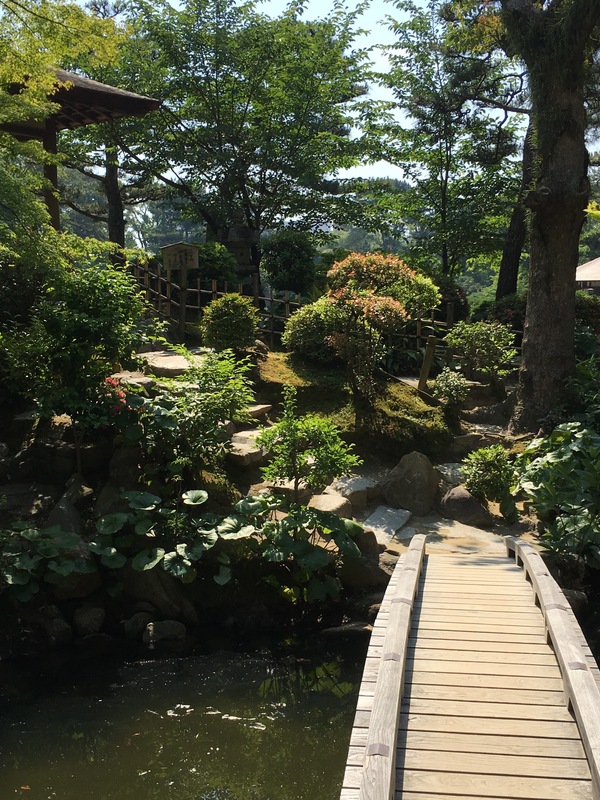 A lovely tucked away gem was the Shukkei-en Garden. We arrived Tuesday morning when it opened. We essentially had the place to ourselves. It was quiet and serene. 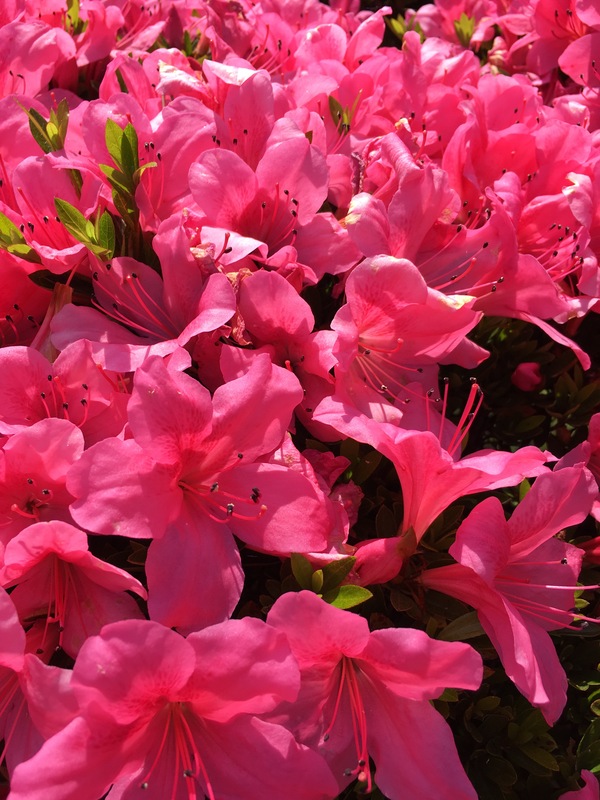 Several azaleas were blooming and the hydrangeas were just beginning to bloom. 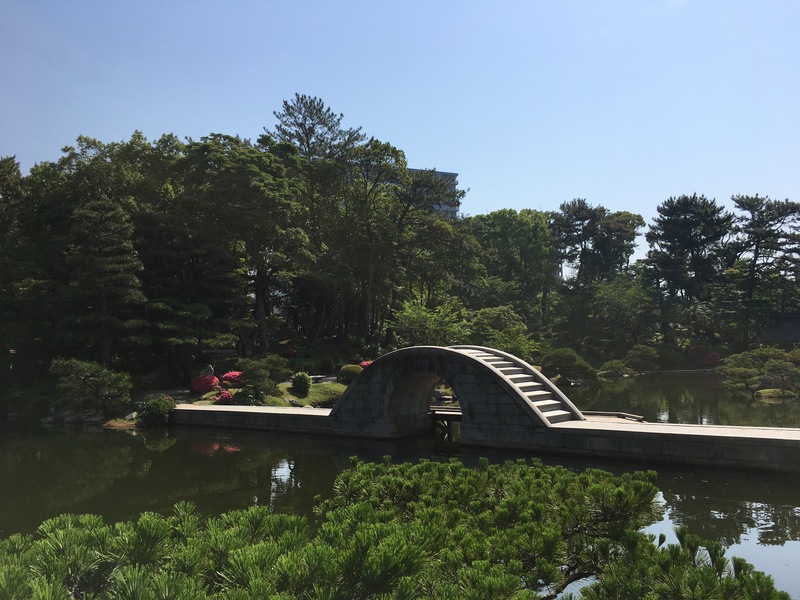 The focal point of the garden was a large pond with several bridges to cross as you strolled through the garden. 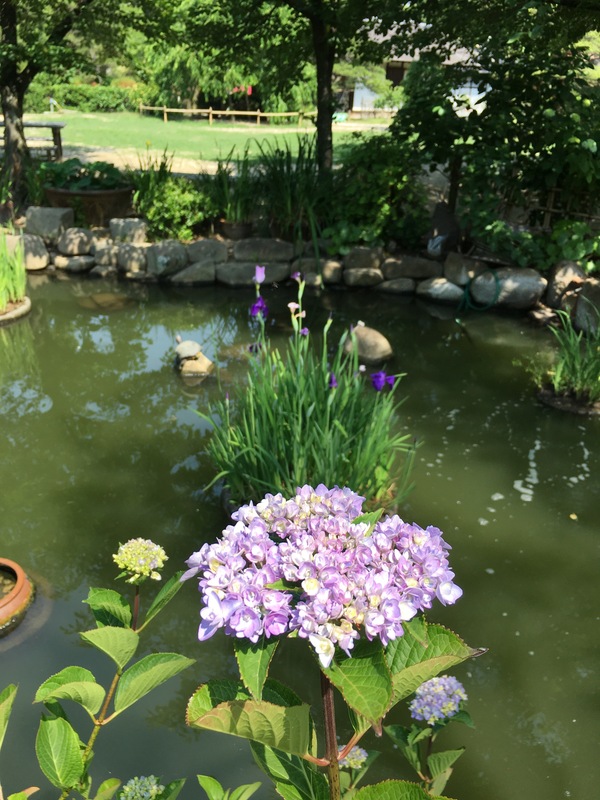 The pond also provided the perfect distraction for Dave. 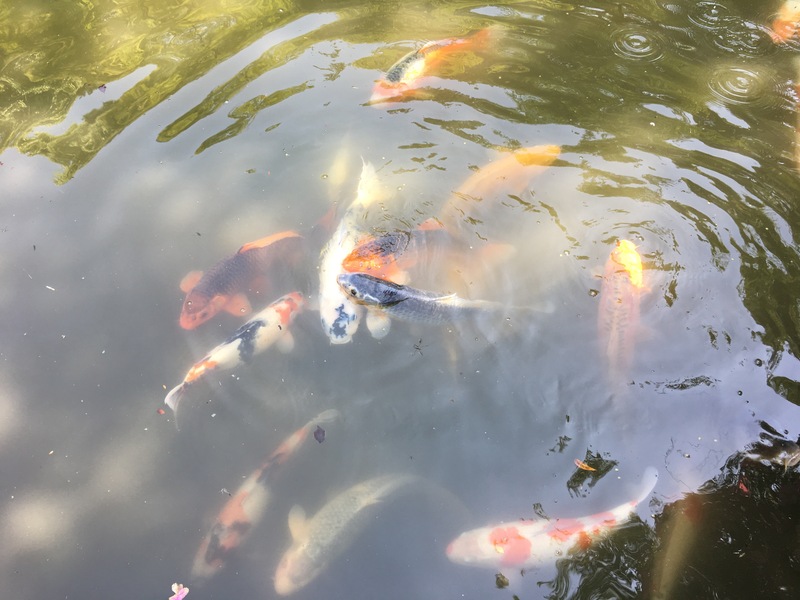 For ¥100 ($1.00), I purchased him a bag of food to feed the numerous turtles and carp. 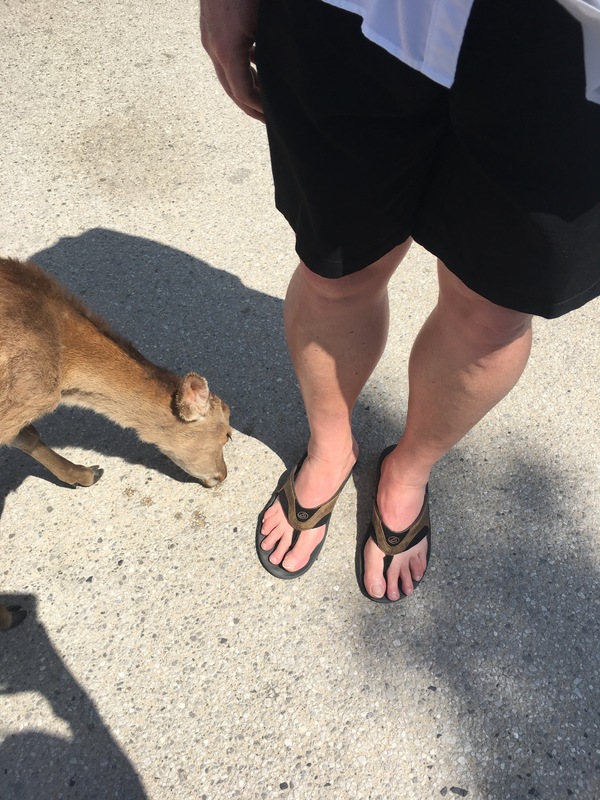 As we walked around, I snapped pictures and he feed the animals. 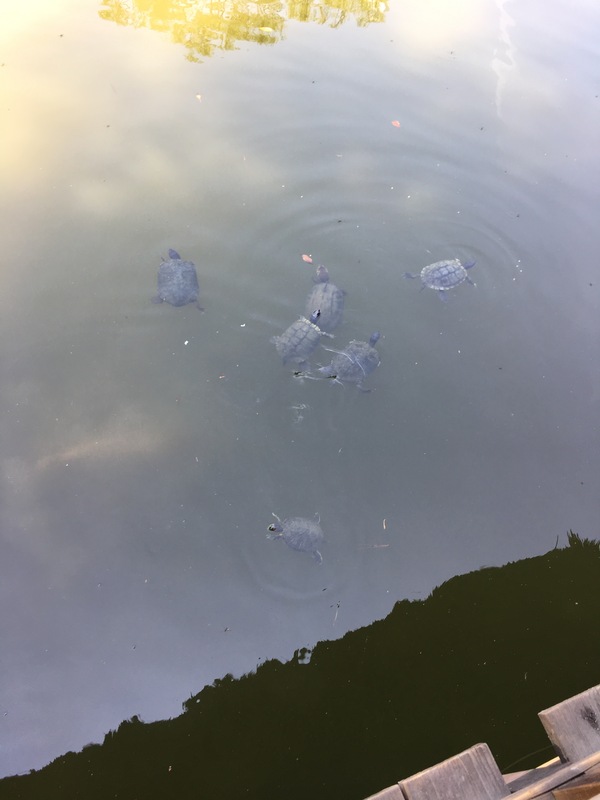 At one spot he had 9 turtles – 3 were to the left of this group. 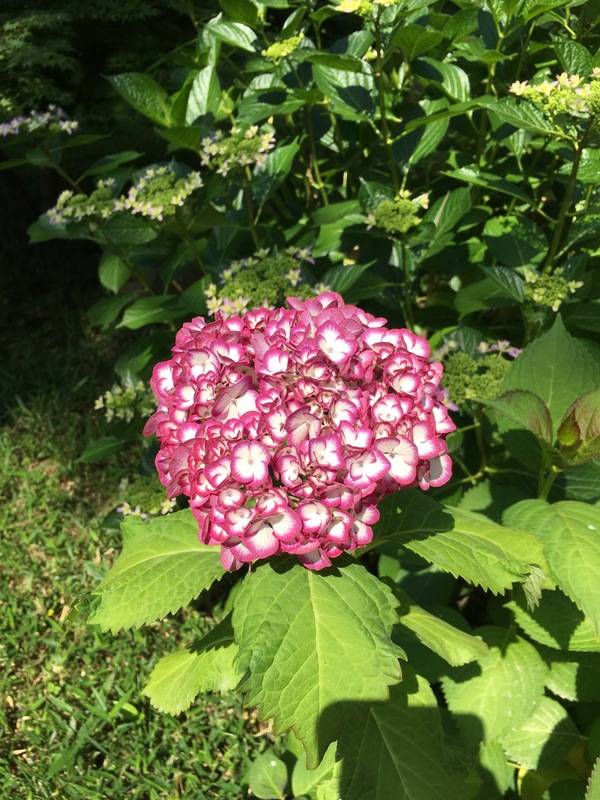 There was a lot of thought put into the development of this garden. The sign explains. 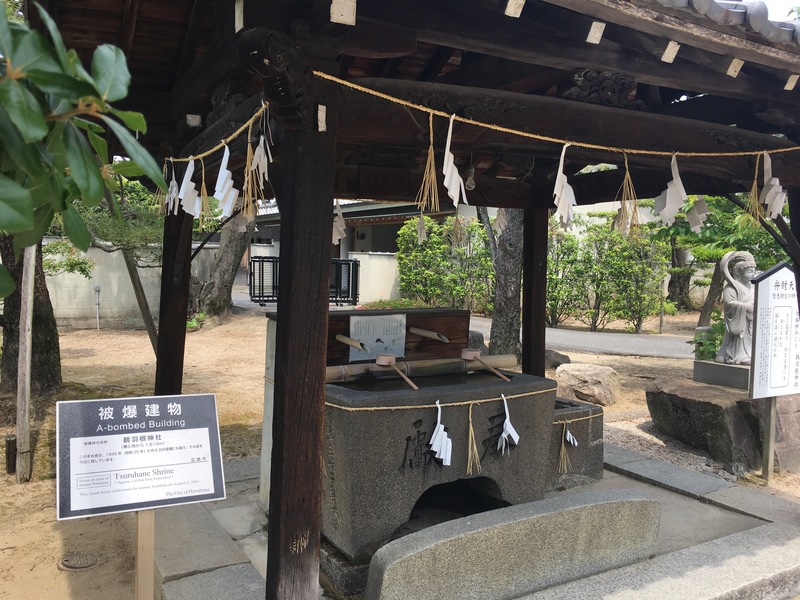 After the park, I had two Shrines I wanted to visit before we had lunch. One was near the castle. (I left my stamp book in the hotel the first day!) 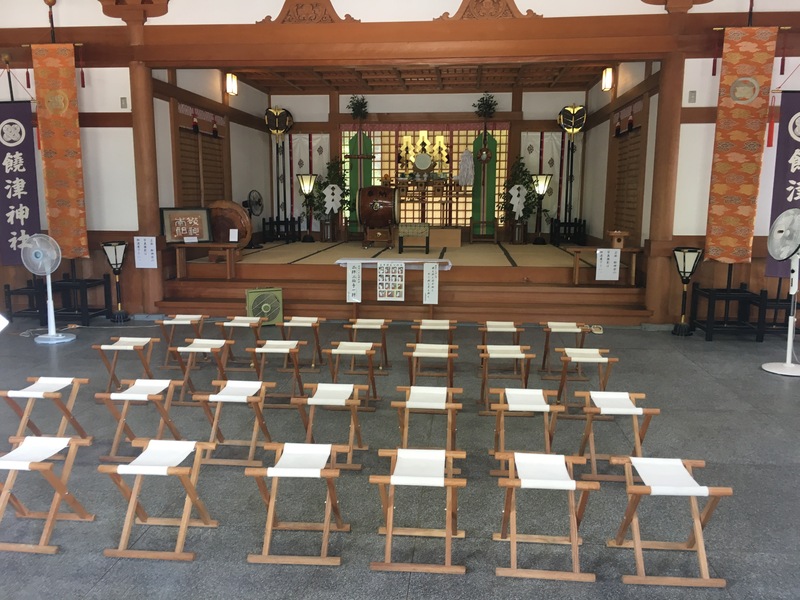 The Hiroshima Gokoku Shrine was very large and lovely. 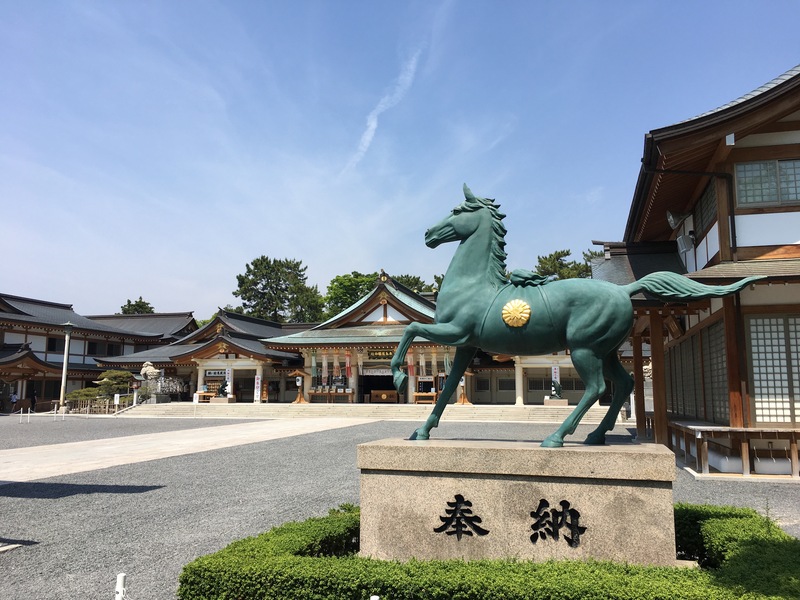 We enjoyed making wishes by the carp statues and mustang. 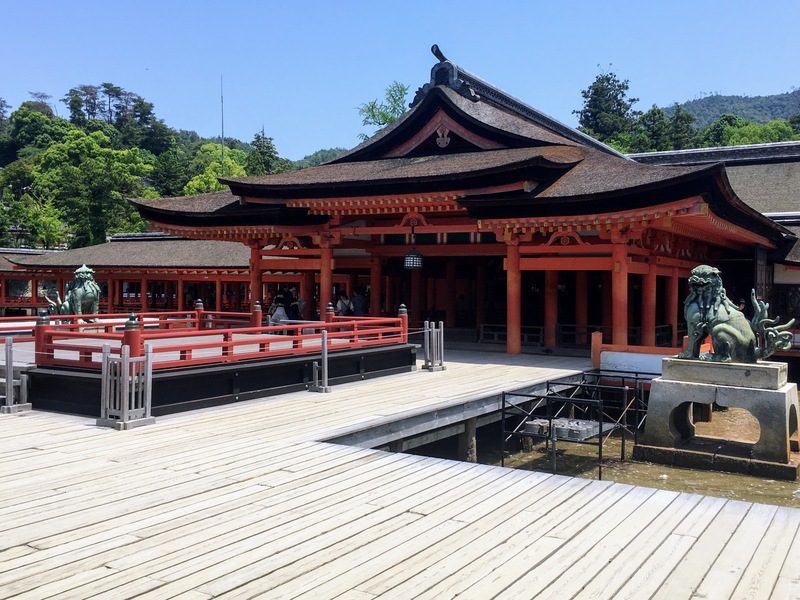 We continued our walk to the Hiroshima Toshogu Shrine. This ended up being the fourth Shrine of the day. Dave counted the steps – 53 to the top! 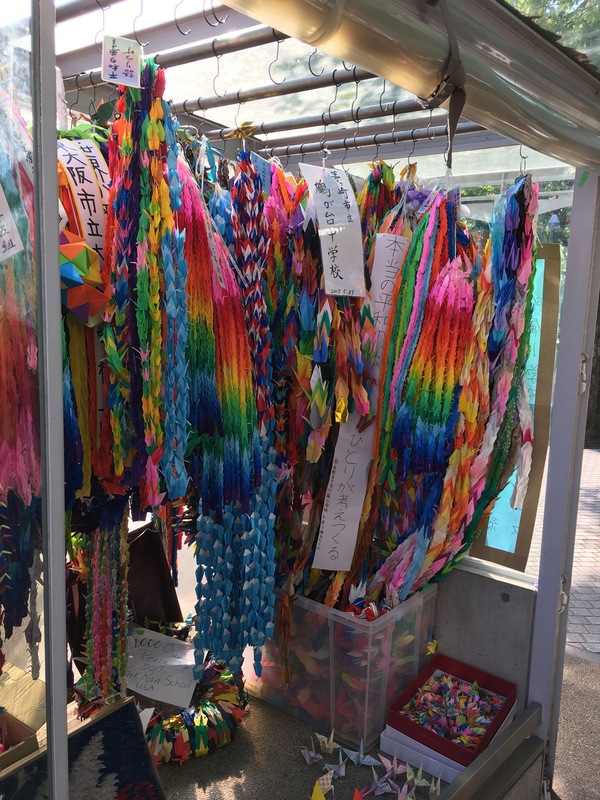 Along our walk to the Hiroshima Shrine, I told Dave we might find a bonus Shrine. We found two! 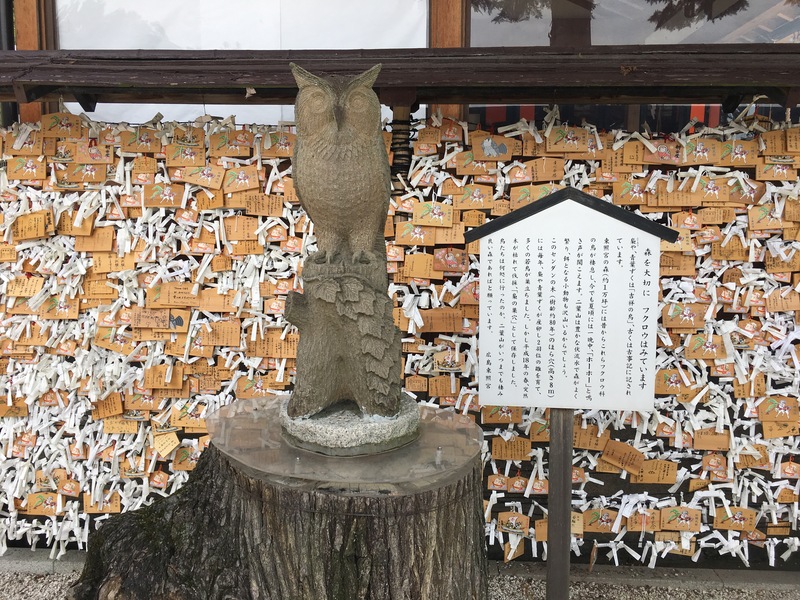 The first was the Nigitsu Shrine. 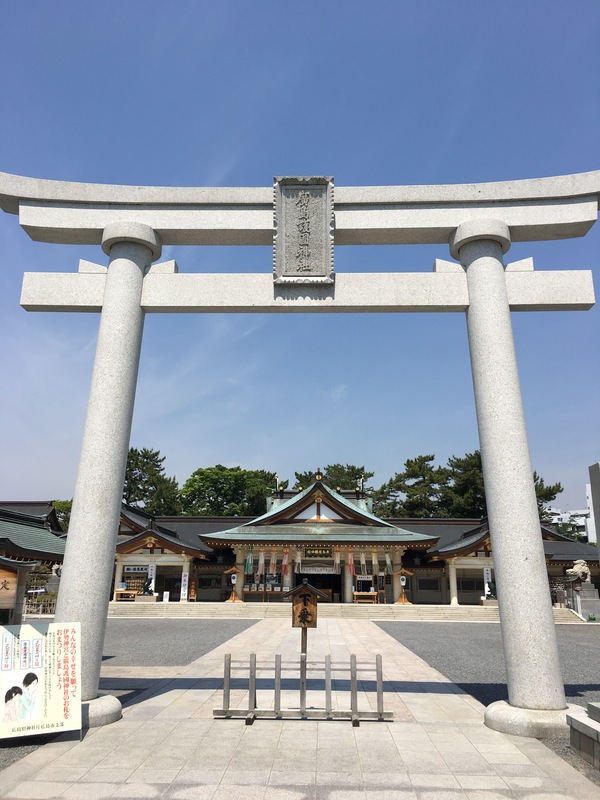 And the second was the Tsuruhane Shrine. 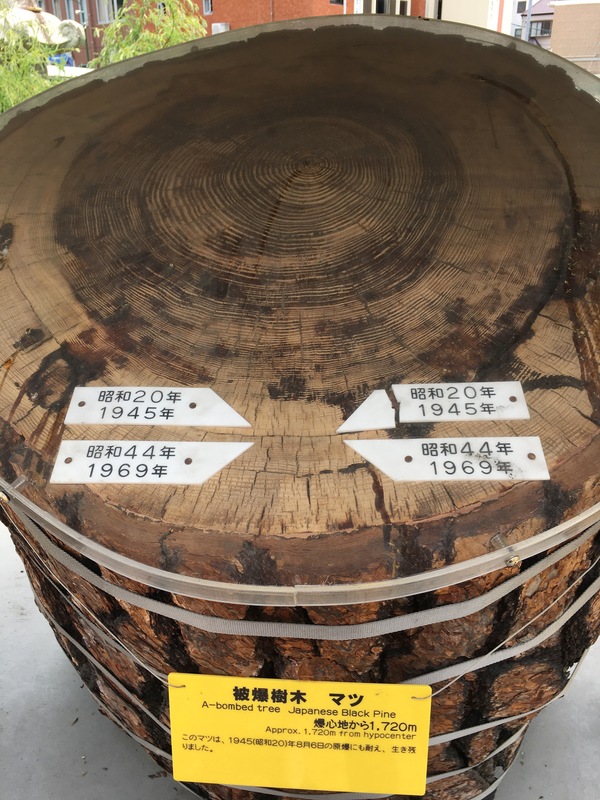 All of the Shrines were destroyed by the atomic bomb. 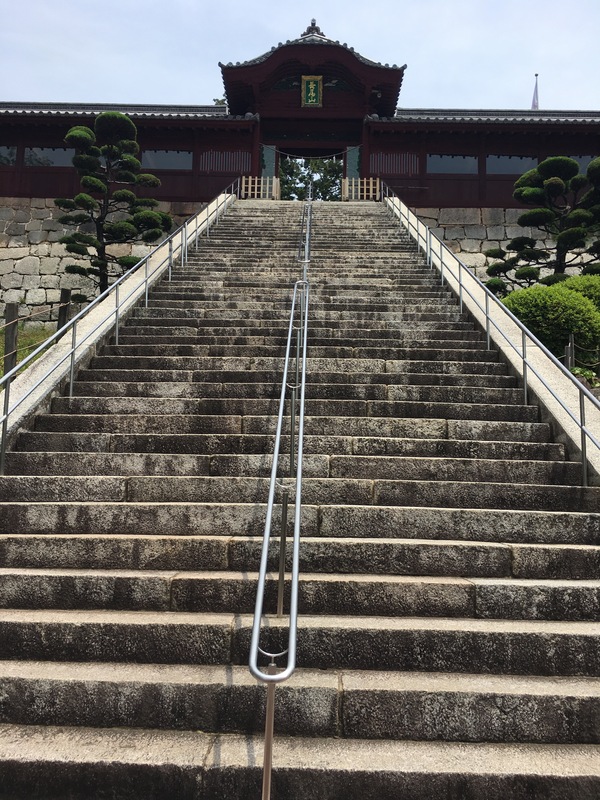 They were rebuilt and along with 12 others are part of the historical walking tour of Hiroshima. 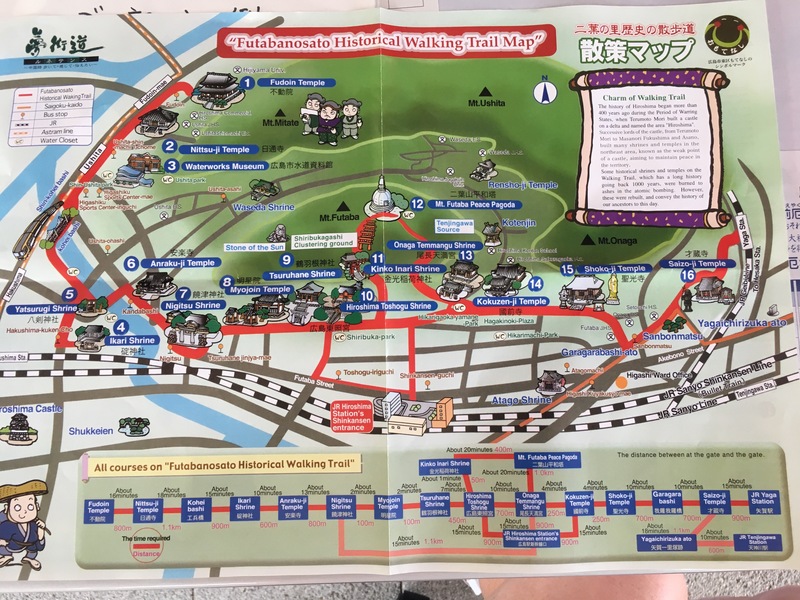 At the Tsuruhane Shrine, I was given this map! Perhaps, if we had more time and we weren’t already sweaty spaghetti, we would have walked the entire route. Maybe next time when you visit! We could almost fill your whole temple book! 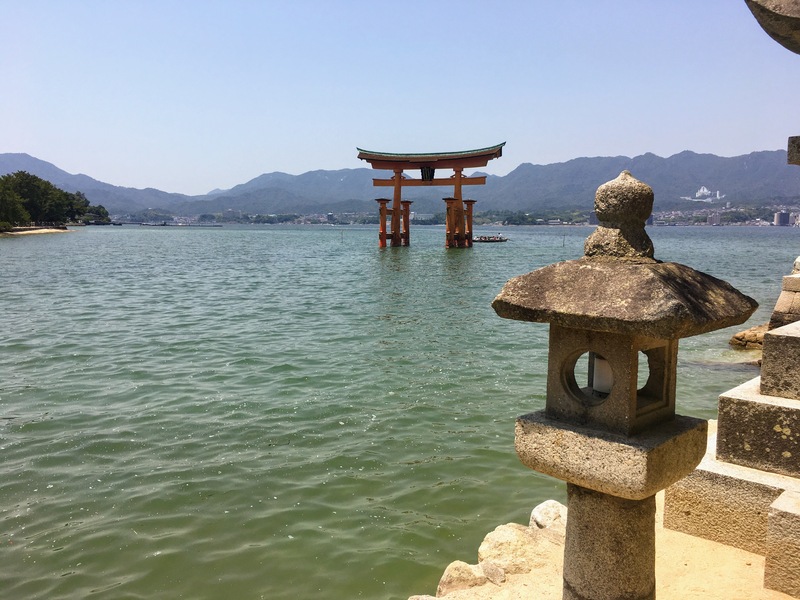 The first part of our tour on Monday morning was a visit to Miyajima Island and the Itsukushima Shrine. 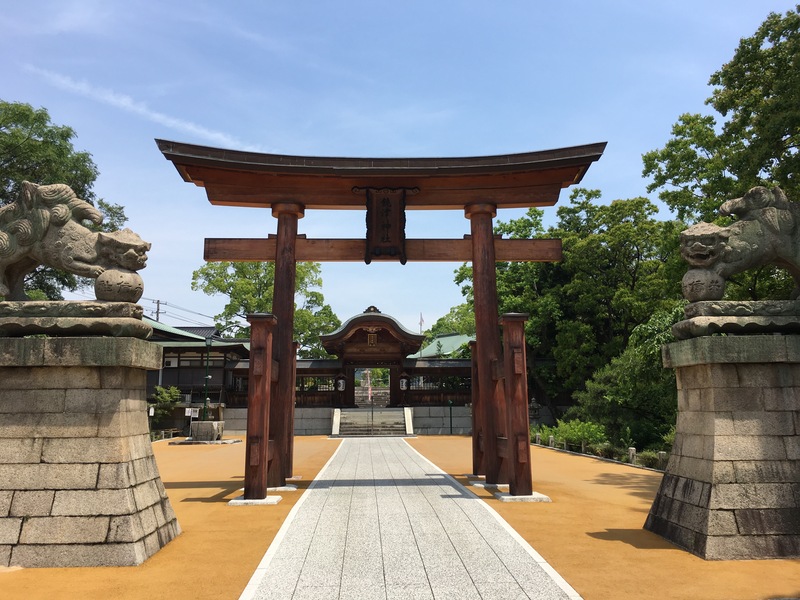 The Torii gate of this shrine is one of the most iconic scenes of Japan. Hiroshima Bay has significant tidal changes. 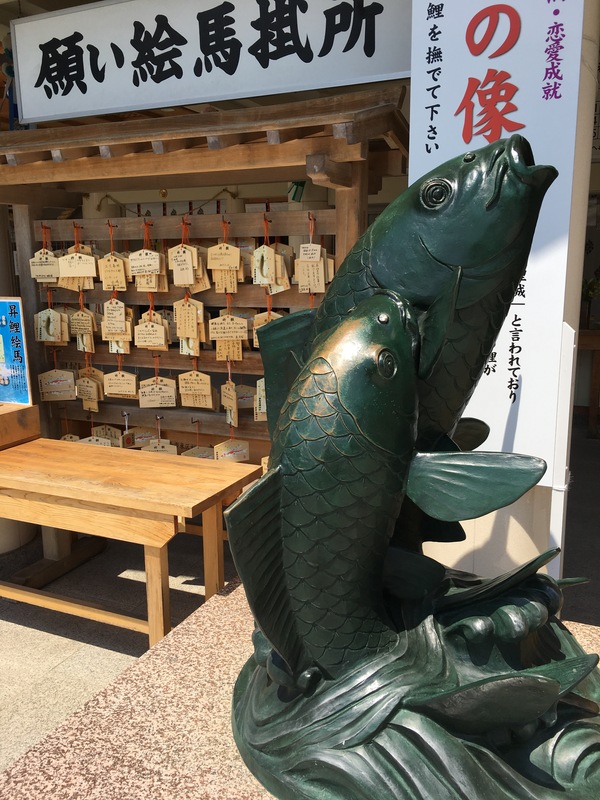 We were able to visit the shrine during high tide. This gives the visitor the impression the Torii is floating. During low tide, visitors are able to walk out to the Torii. 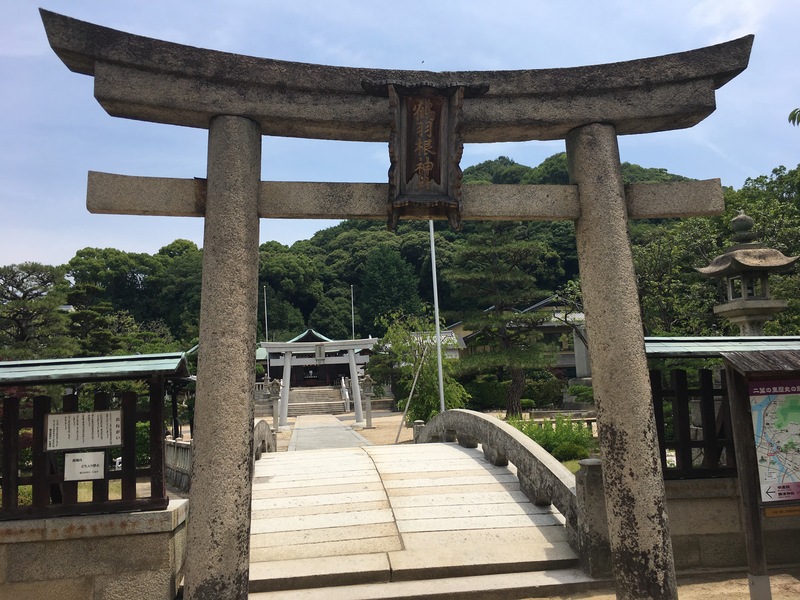 The views of the Torii as we approached the shrine were majestic. One selfie to prove we were here! Pardon my fly away ferry hair! Our tour guide shared interesting details about the Shrine. Here is a summary from my notes. The Shrine is dedicated to the Shinto Gods of the seas and storms. The island was considered sacred and commoners were not allowed to visit the island. 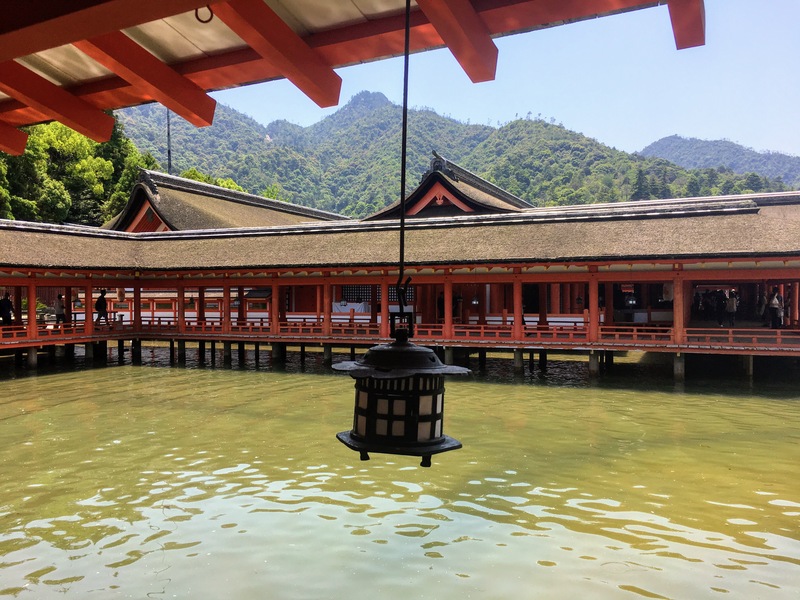 The Shrine was built over the water to allow visitors to make their pilgrimage without actually stepping on the island. 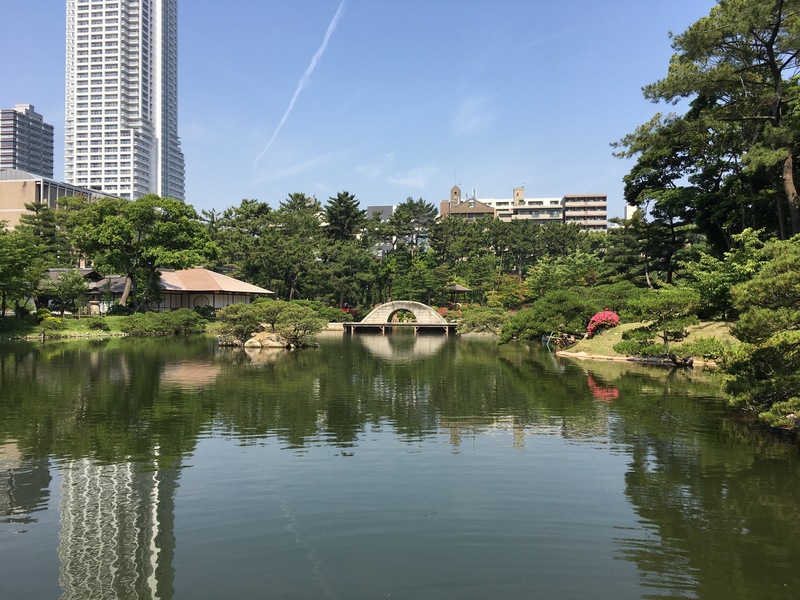 The red entrance Torii gate, was built over the water for the same reason. 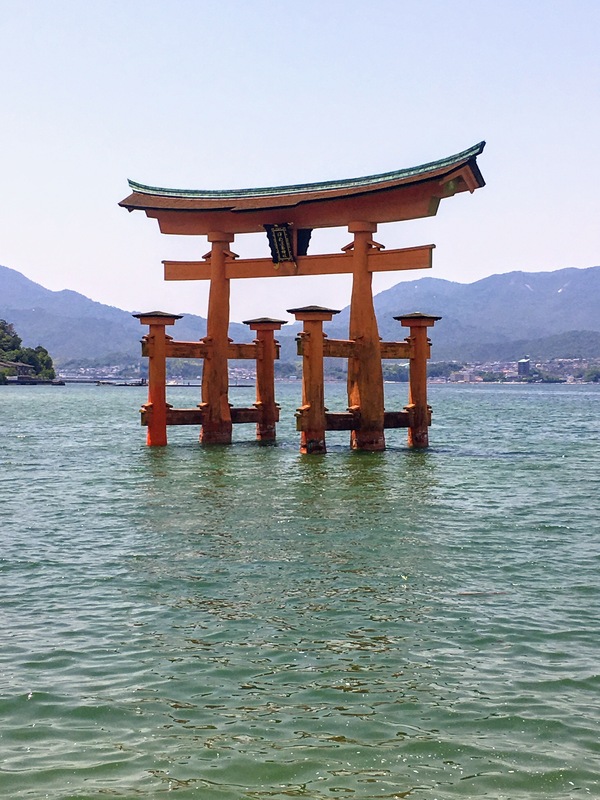 Commoners were expected to steer their boats through the torii before approaching the shrine. 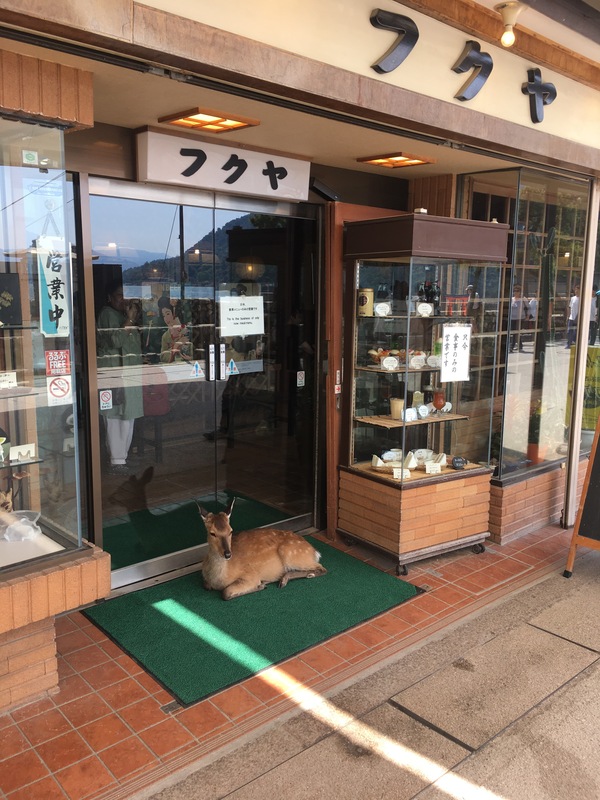 Interestingly, in an effort to retain the purity of the Shrine, neither deaths nor births are permitted near the shrine. In fact, terminally ill residents and pregnant residents of the island are expected to return to the mainland to pass away or deliver their child. Simultaneously, burials are prohibited on the island. 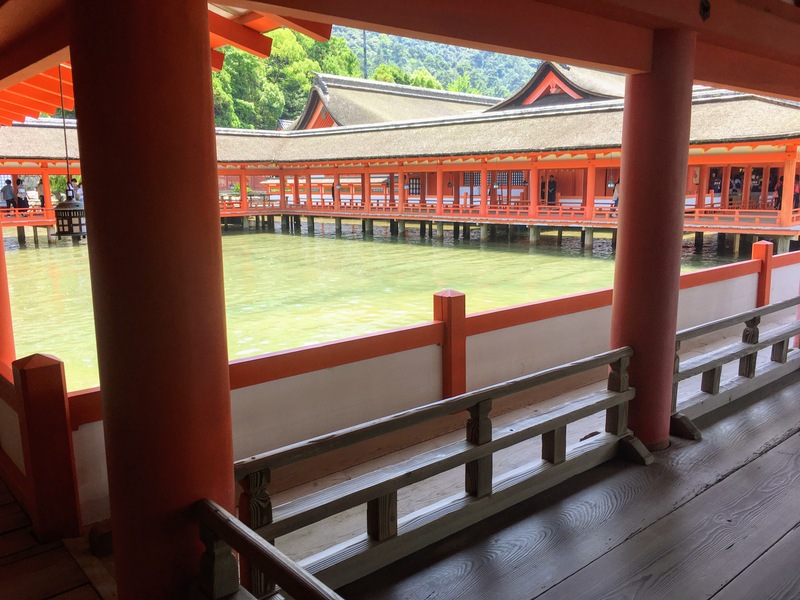 The Itsukushima Shrine was beautiful and presented the opportunity for many incredible pictures. 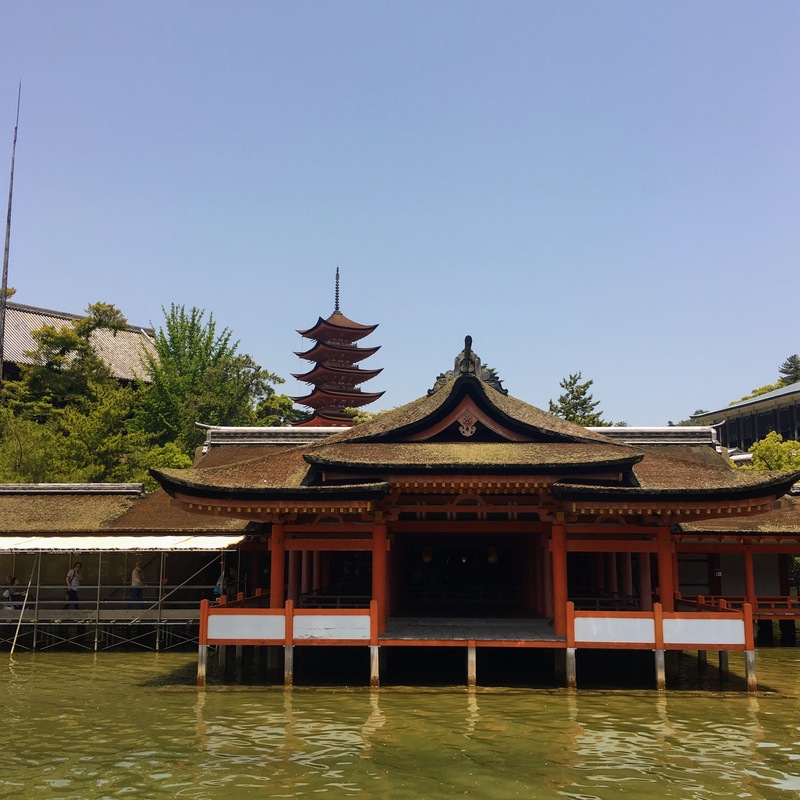 After our visit to the Itsukushima Shrine, we walked around the main shopping street. 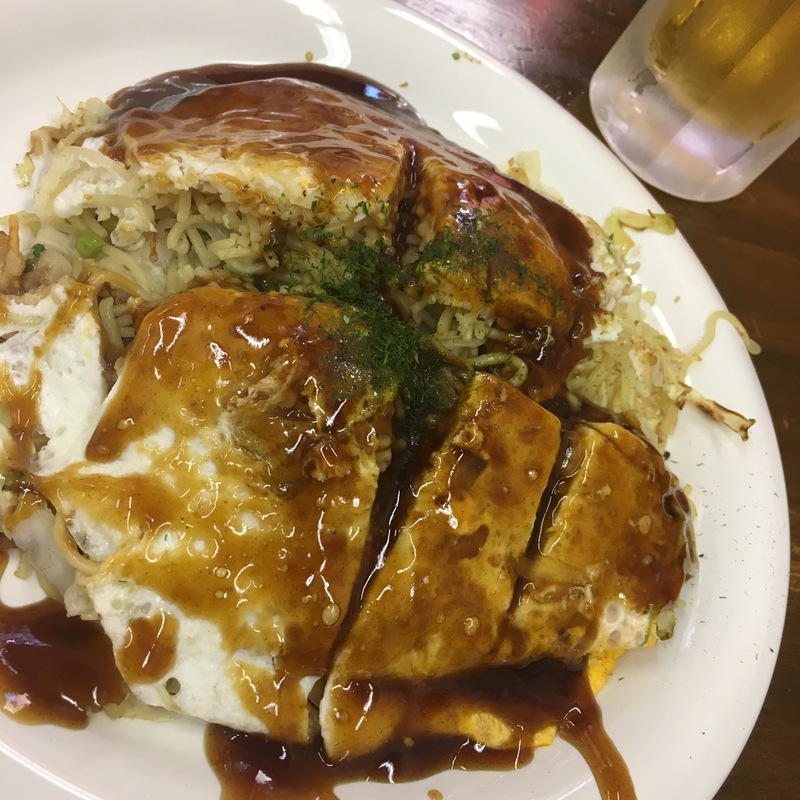 We enjoyed a famous lunch of okonomiyaki. Hmmmm. 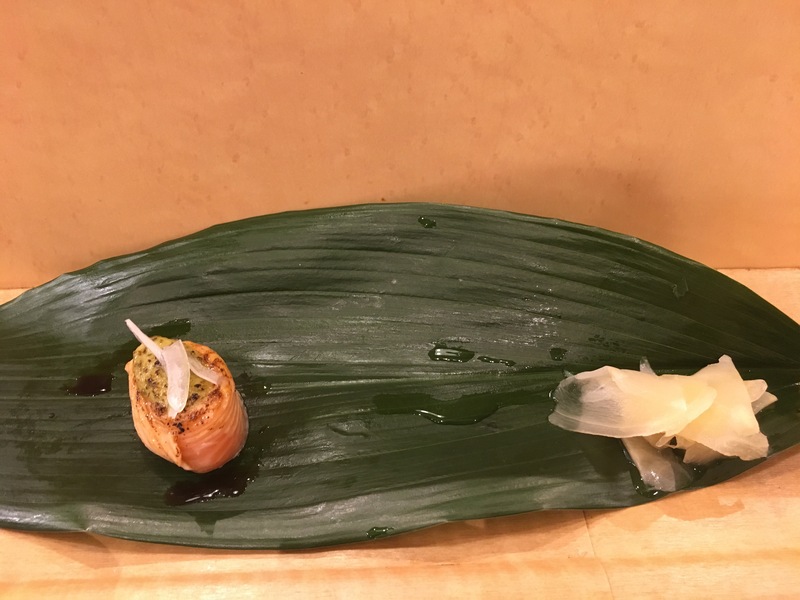 There was so much going on with this special dish. It was a flour tortilla loaded with everything imaginable. 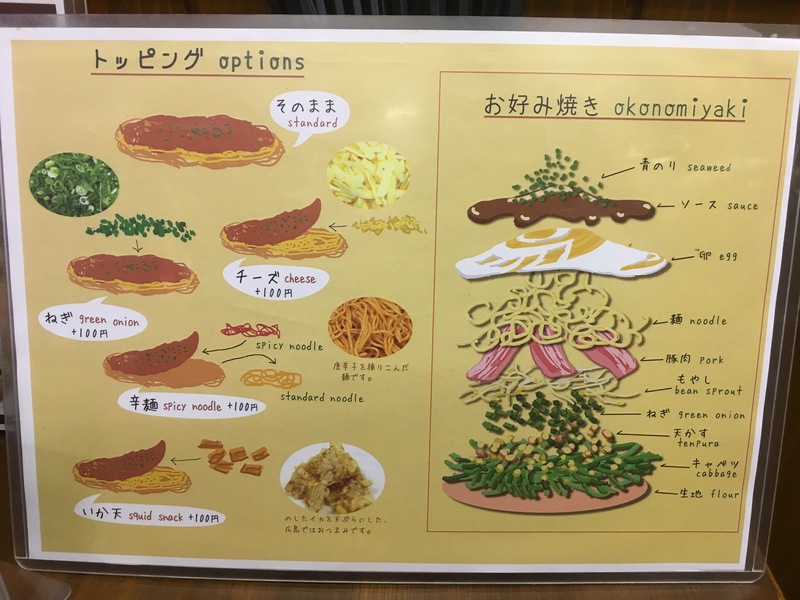 The first picture illustrates the construction of the ingredients. It goes in my list of “I can say I ate it and I don’t need to eat it again.” Honestly, it was the sauce. Too much. 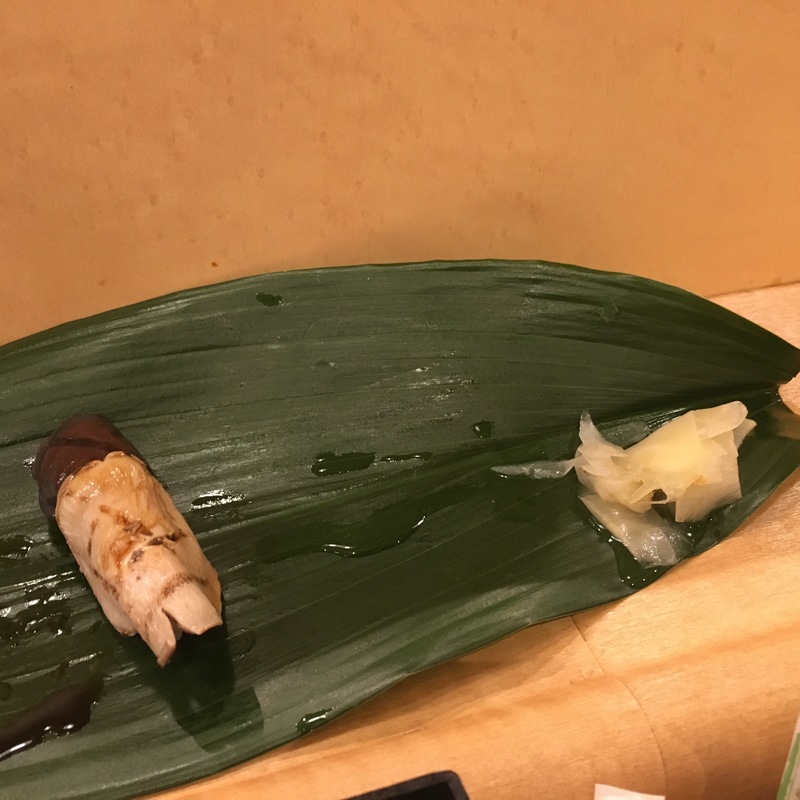 It was like a thick and too sweet teriyaki. Here is a picture of the history behind the dish. 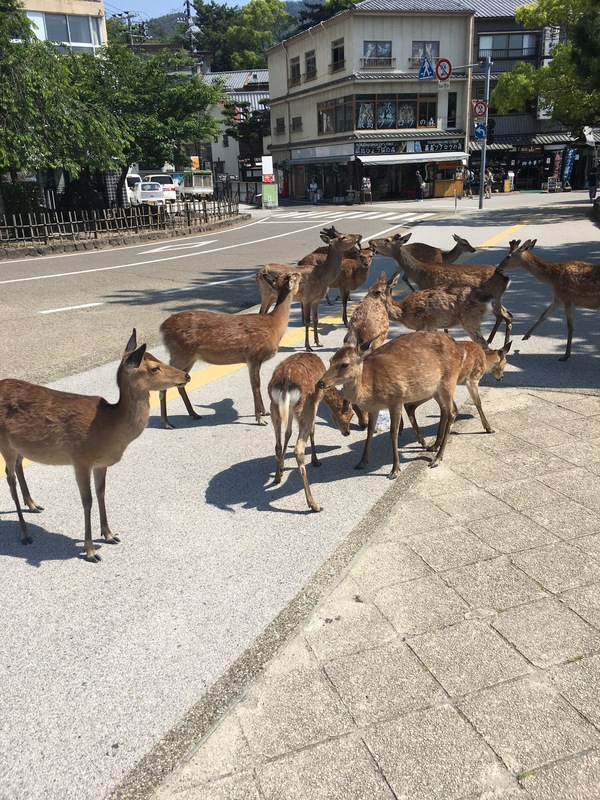 The final highlight of Miyajima Island was the number of deer. 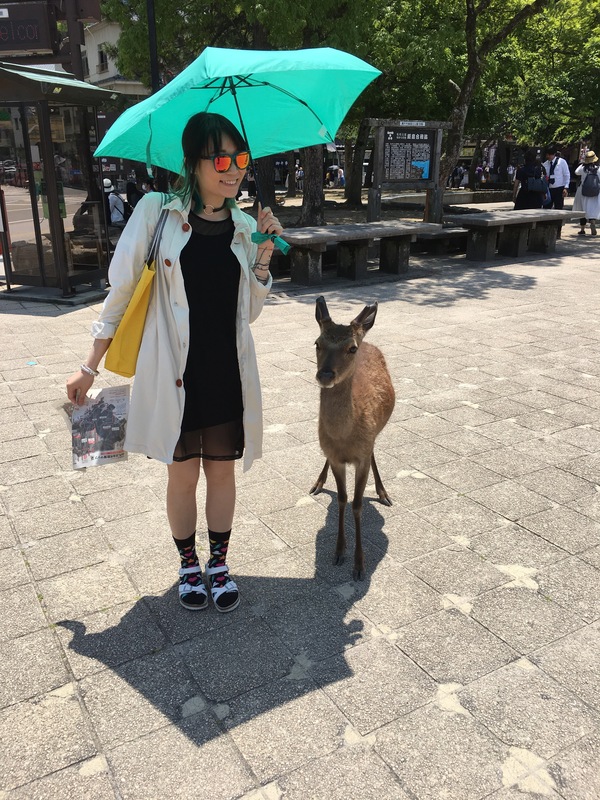 Yes, deer. Everywhere. And they were looking for food! Camped out in front of a restaurant! This picture was my favorite! 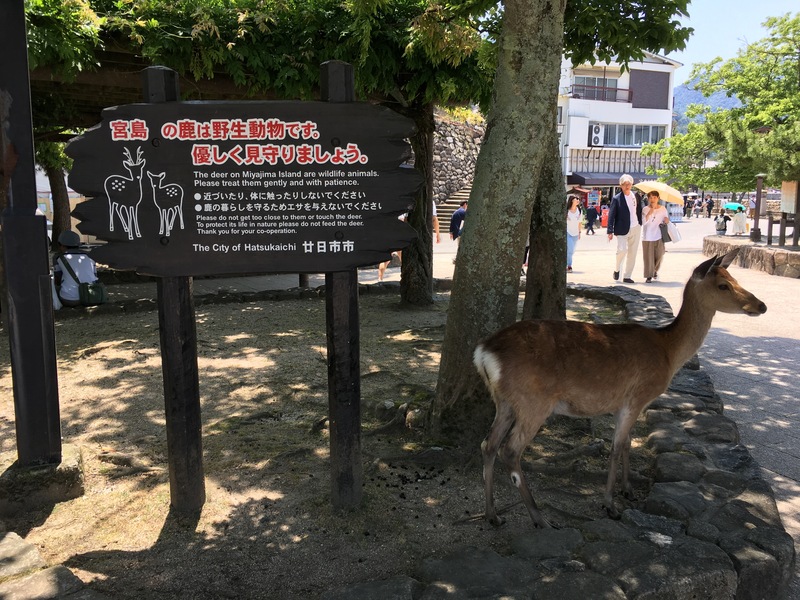 The wild deer was stoically posed by the sign! Ha! 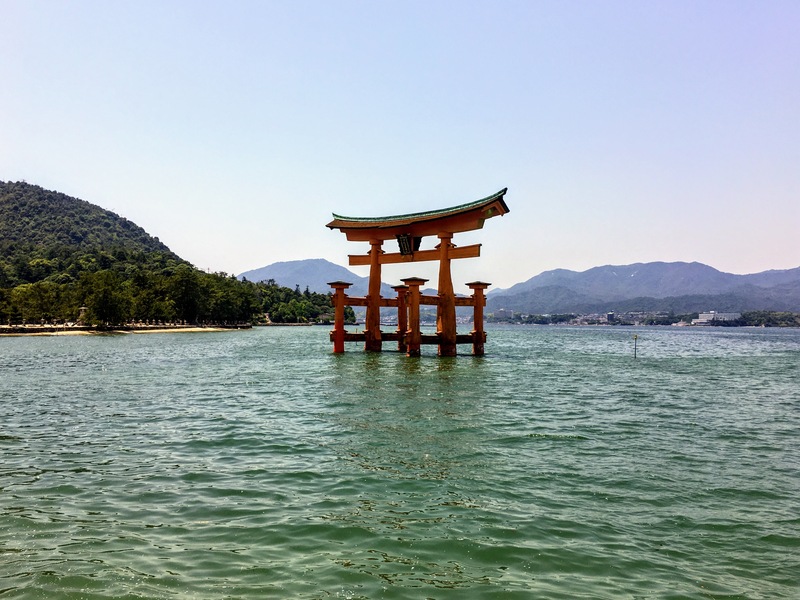 Miyajima Island was a highlight of the weekend. If we have time when you visit to make the trip, we should spend the night on the island and perhaps do some hiking. I know we will both enjoy our time on the island! 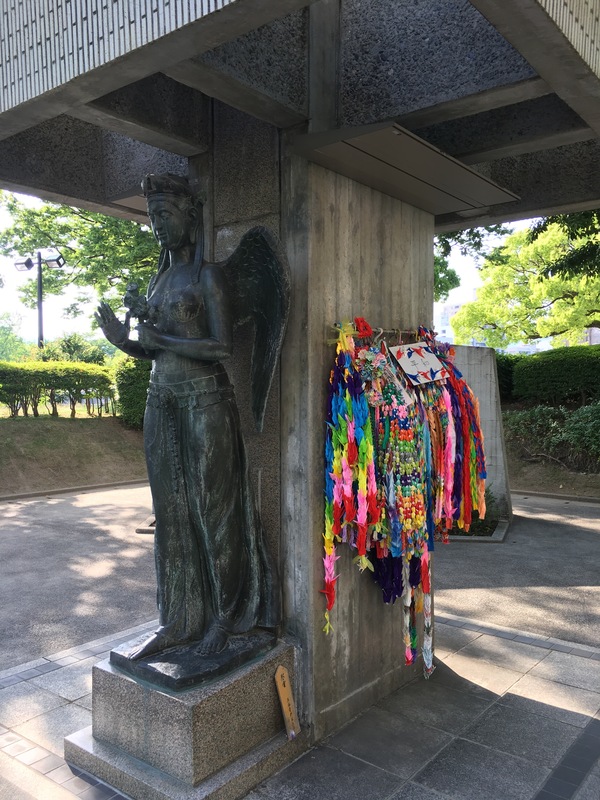 On Memorial Day, Dave and I had the opportunity to visit Hiroshima Peace Memorial Park and Museum. 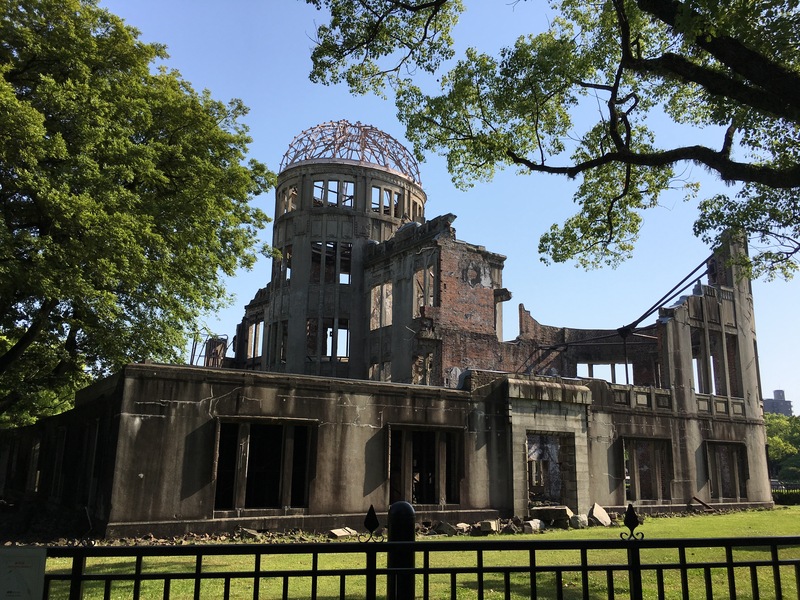 It was intense and moving to view the destruction and hopes for peace. Before entering the museum, we walked around the garden. There were many different monuments and statues dedicated to the victims and survivors. Perhaps the most iconic is the Atomic Bomb Dome. Here are a few pictures. The gravity of the destruction was intense. This specific spot was selected as the target because the bridge (we are standing on the bridge when I took this picture) and the river created a “T” making it easily identifiable from the air. The building has been preserved in its destroyed state as a reminder of the event and as a sign of hope for peace. Another significant monument is the eternal flame for peace. The flame burns for peace on Earth. I reflected on former President Obama’s speech from last year. I included a segment for you. I found it very poignant. He gave his speech standing in front of this monument. The eternal flame for peace and Atomic Bomb Dome are in the background. 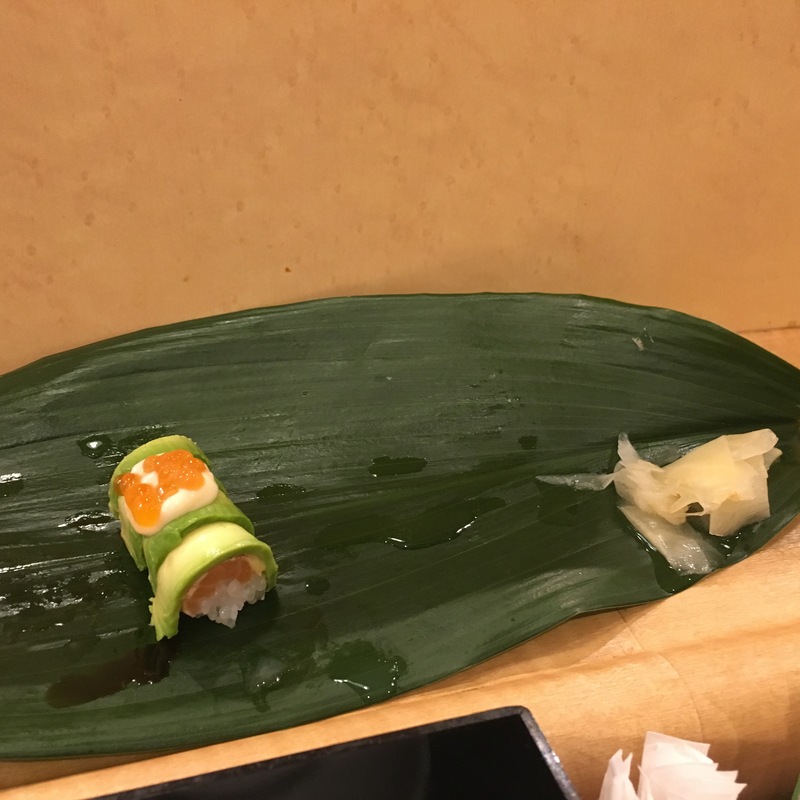 “Why do we come to this place, to Hiroshima? We come to ponder a terrible force unleashed in a not-so-distant past. We come to mourn the dead, including over 100,000 Japanese men, women and children, thousands of Koreans, a dozen Americans held prisoner. Another highlight within the park is the Children’s Peace Monument. Here is the story of the monument and the 1,000 cranes. The monument and the cranes. It is difficult to see because of the lighting, the Peace bell is hanging within the statue. Visiting the park was a very intense experience. The museum amplifies the intensity. 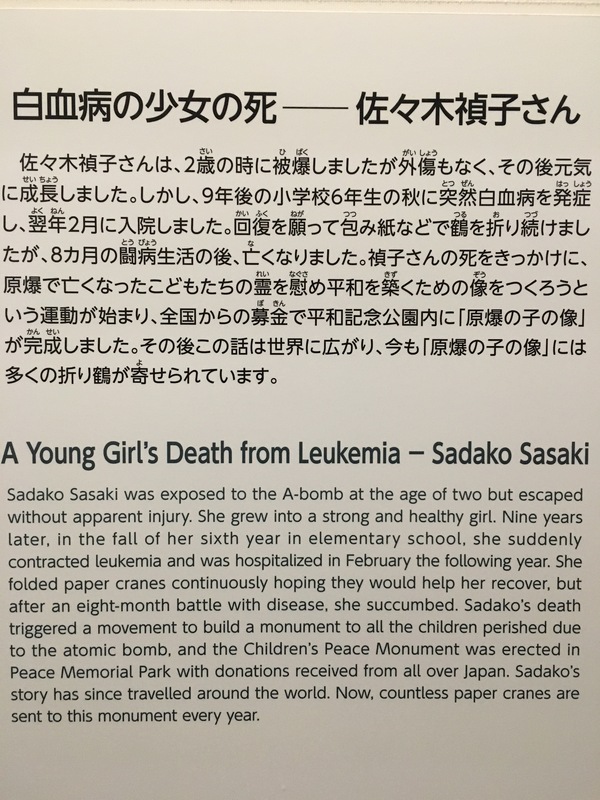 The exhibits focus on the impact of the bombs on the victims. I didn’t take many pictures because I felt the pictures didn’t tell the story like the exhibits. I liked the way our tour guide summed up the experience of our visit. She encouraged us to tell people about our visit and to hope for peace. Also, we must hope there is never another Hiroshima. 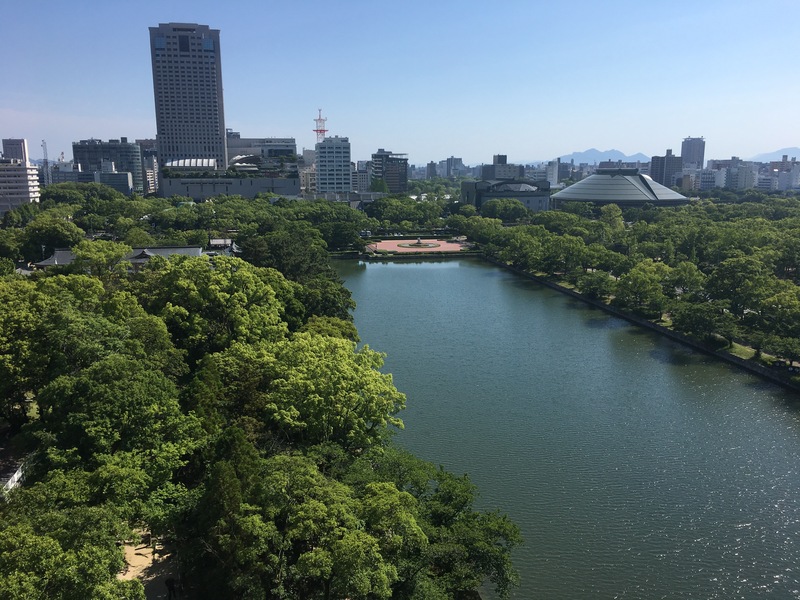 Spending time this Memorial Day in Hiroshima will be an experience I always treasure and will continue to inspire me to spread and bring peace. I must confess. I was completely giddy anticipating our Shinkansen trip. Riding the Shinkansen (Bullet Train) has been at the top of my Japan Bucket List. 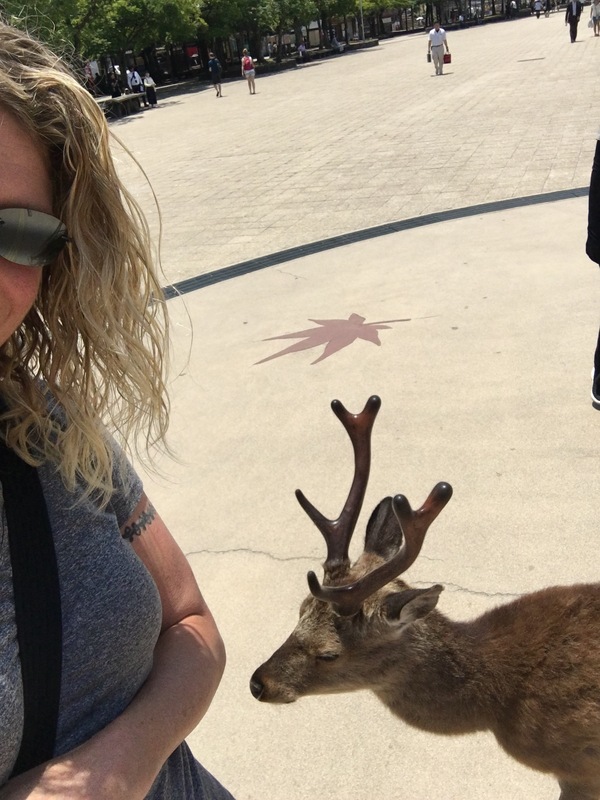 Our trip to Hiroshima was the perfect opportunity. We boarded the Shinkansen in Shinagawa. 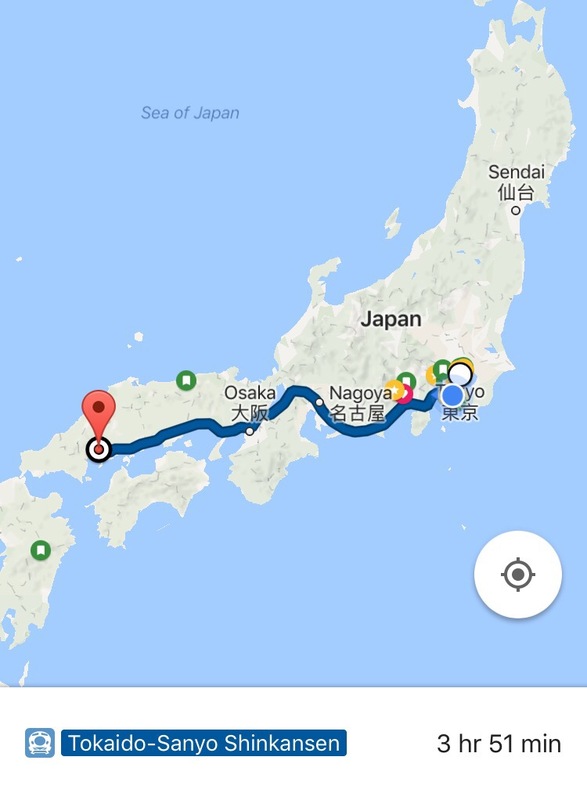 Here is the route to Hiroshima. 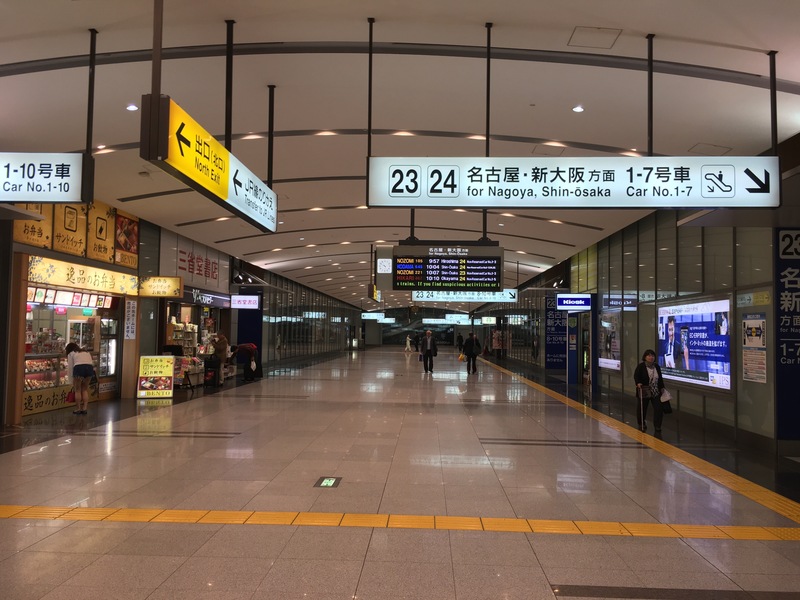 Considering this is the Shinagawa Shinkansen station, it seemed empty! Our train was on track 23 – car 6. I took a video and several pictures while waiting for our train at 10:17am. I was only reprimanded once for not standing behind the yellow line! Oops! The video is of the train leaving. I thought it would show the speed better than the train arriving. ​This is our train arriving. I used the burst setting on my phone. It was still blurry! 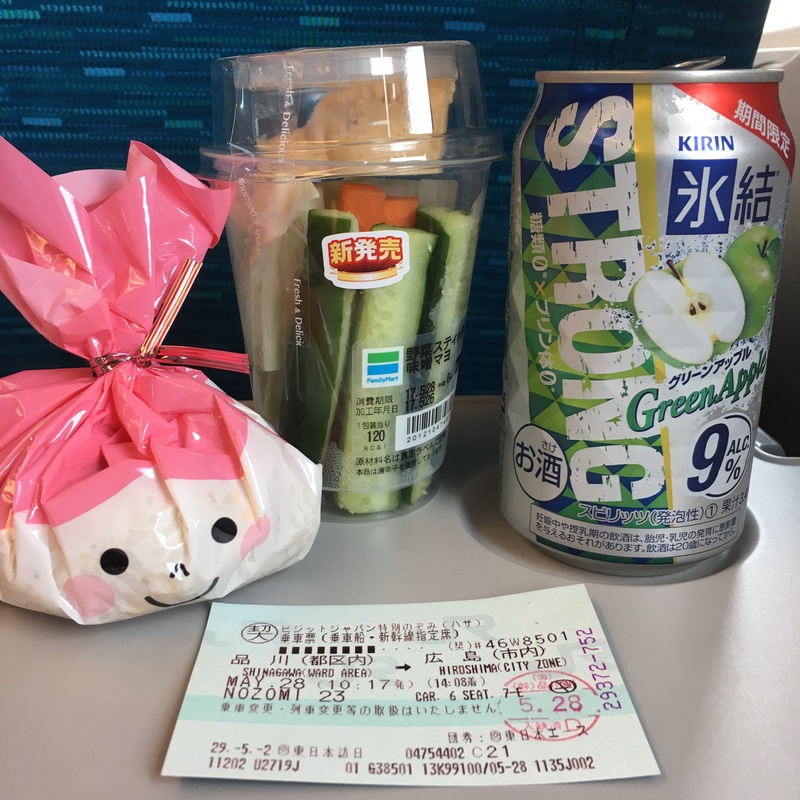 Once on the train, I unpacked our snacks! We packed the needed provisions. 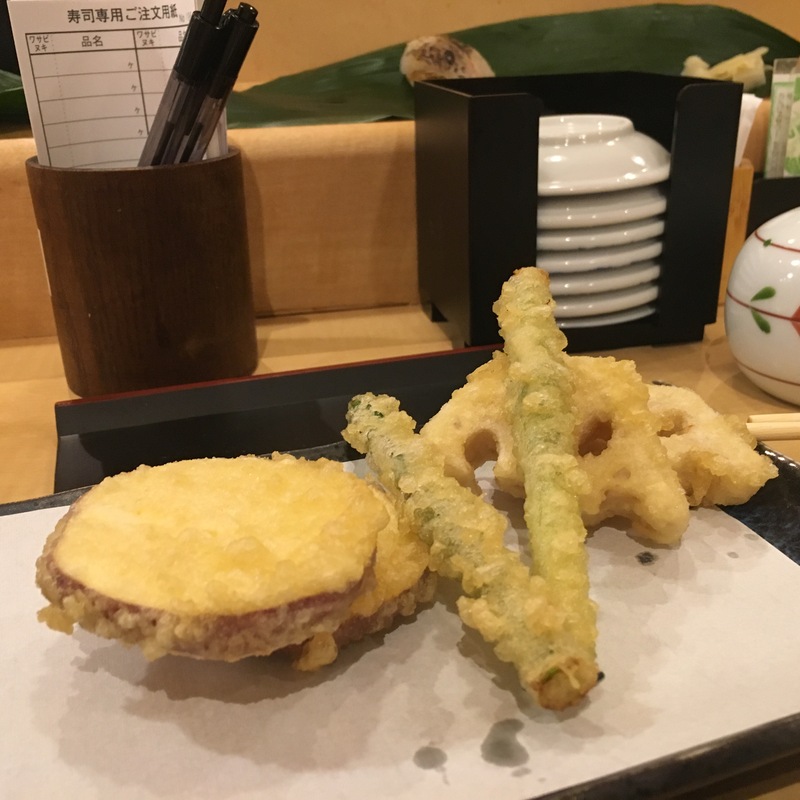 A homemade rice ball, veggie sticks, and several chūhai. We settled in nicely for our almost 4-hour journey. 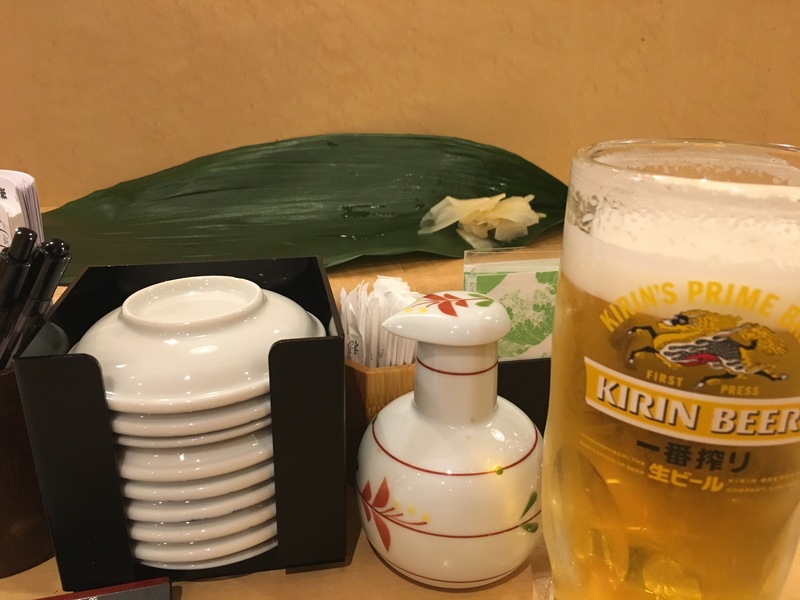 Let me tell you a little bit more about the Shinkansen. My source was Wikipedia and the JR Train website. I summarized and made it reader friendly. Speed – the maximum is 200 mph. The average speed is between 150-185 mph. 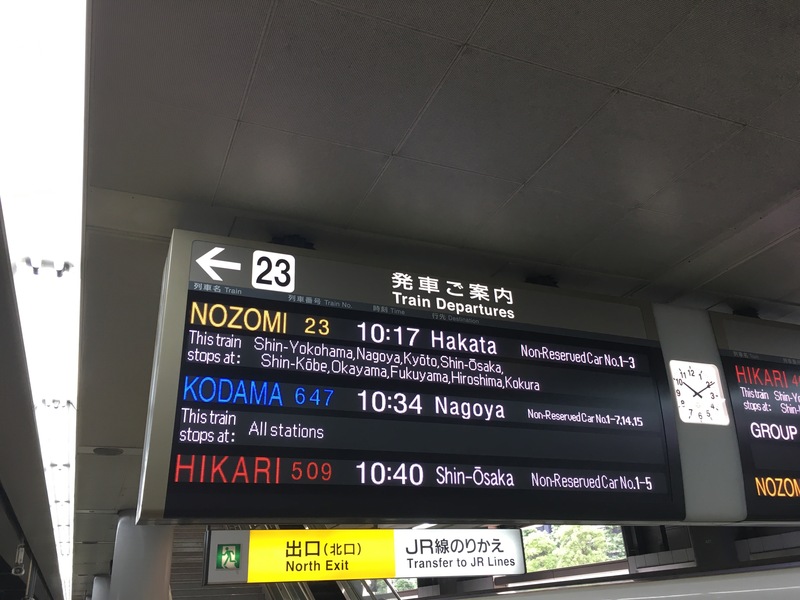 The Route – the Shinkansen tracks are their own separate system. They do not cross roads or go around obstacles. They go through or over any obstacle. Most of the time the tracks are slightly elevated above surrounding landscape. Curves are kept to a minimum. Because as we all know, the fastest way from point A to Point B is a straight line. The Tracks – the tracks are Standard Gauge (wider tracks – lower center of gravity) vice Narrow Gauge. Being an Austin, I’m not embarrassed to admit I know the difference. Also, the actual rails of the tracks are longer. This reduces the number of welds required and the effects of thermal expansion within the rails and therefore provides a smoother ride. The Trains – the trains are lighter and can accelerate or decelerate quickly. This reduces the amount of damage to the tracks. Also, the cars are air-sealed to ensure stable air pressure when entering tunnels at high speed. Side note: I felt the speed the most when going through the tunnels. 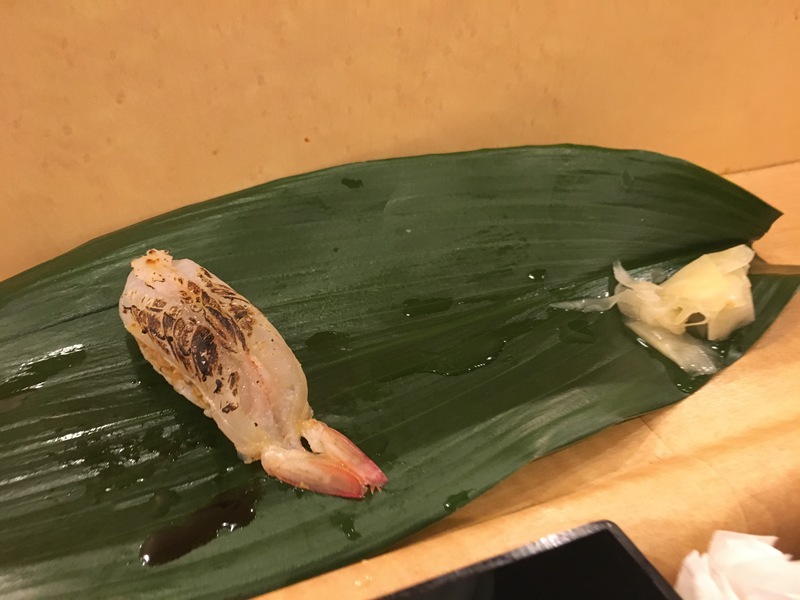 The combination of the speed and confinement created excessive pressure on my ears. 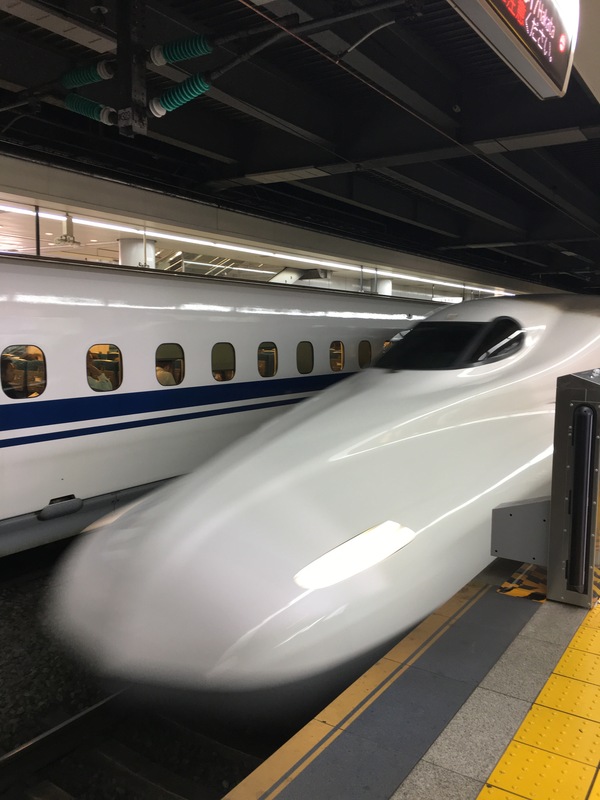 Environmental Impact – the average ride (per passenger) on the Shinkansen produces 16% of the CO2 produced by the same trip made by a vehicle. Considering the Shinkansen has 342 daily departures with 1,323 seats per train, that’s a much smaller carbon footprint than driving. Safety – Very. No fatalities from derailments or collisions. Deaths have occurred from people rushing the train and suicides. 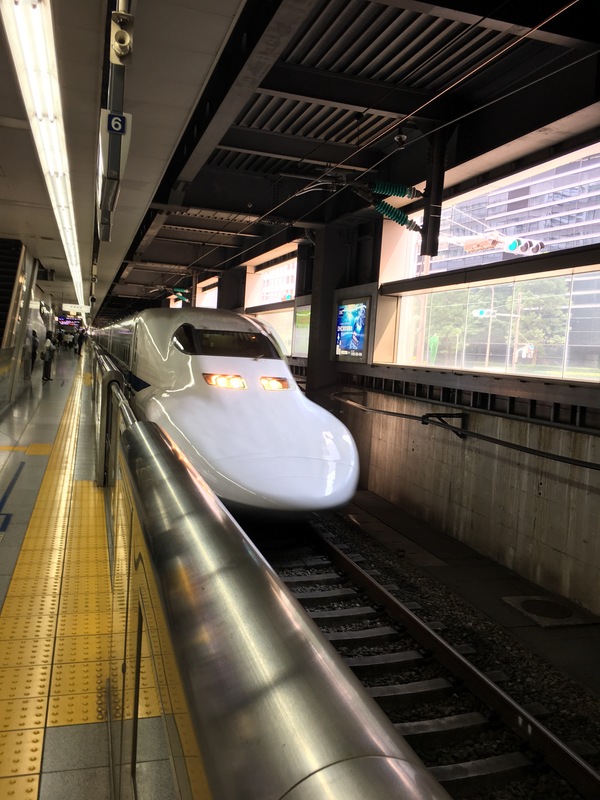 Taking the Shinkansen is a fantastic alternative to driving and much less hassle than flying. We were able to book a train, hotel, and tour package at a very reasonable price. 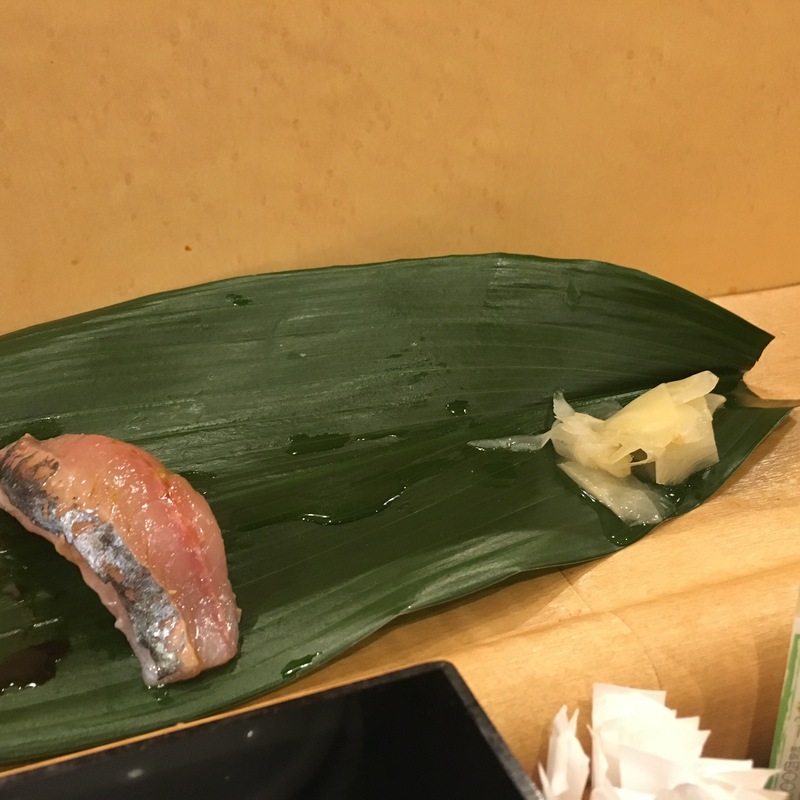 I hope when you visit, we have the opportunity to visit another part of Japan via the Shinkansen. You won’t be disappointed! !